It almost hurts the eyes, doesn’t it? 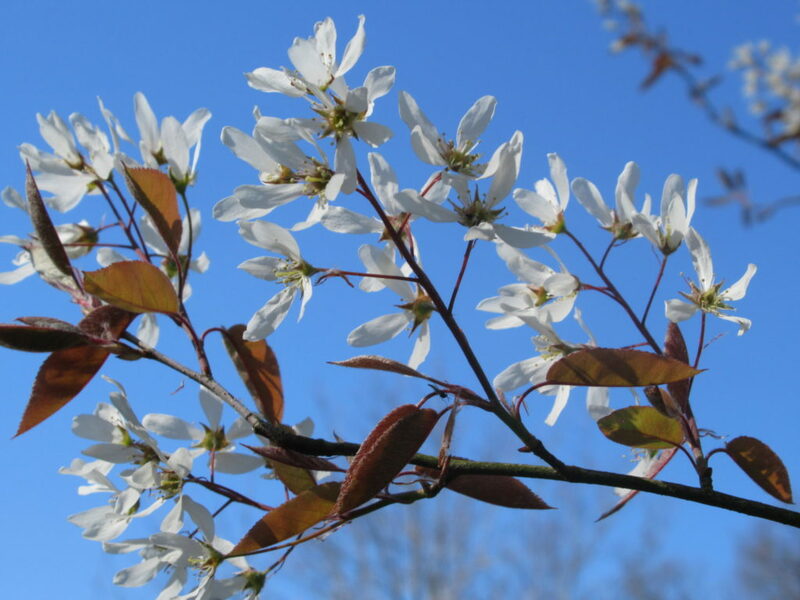 That blue, blue sky with those bright white flowers of the June berry. I was taking a spin on my bicycle when I took this photograph. Something was bothering me, and I thought a bit of exercise and fresh air might help clear my mind. The air was certainly fresh, not to say icy. I was glad I was wearing my woollen gloves. But what a glorious afternoon! You’d expect the air to be filled with the sound of bleating, but it wasn’t. 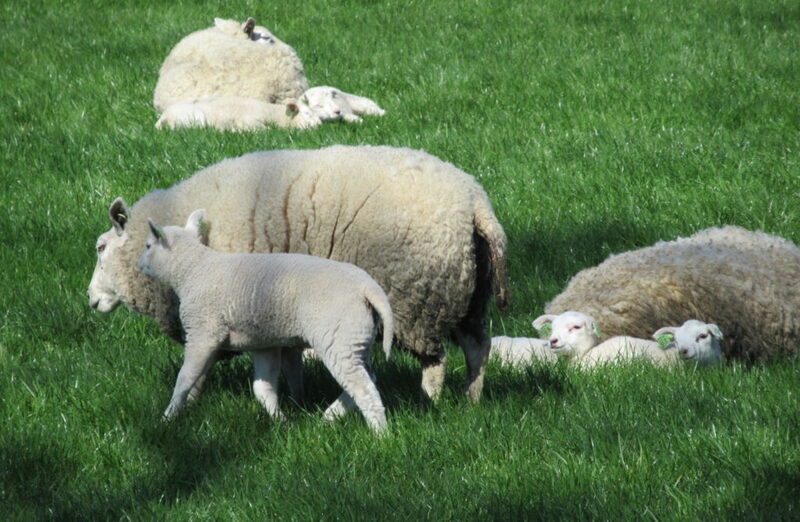 The sheep and their lambs were quietly dozing or grazing – or following their grazing mums around – and watching each other. 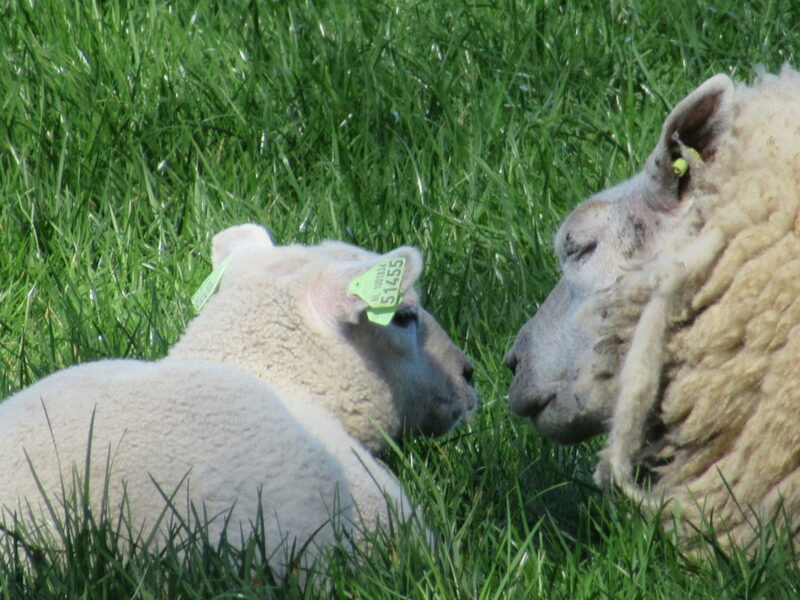 We all know that ewes and their lambs can recognize each other’s voices. But we don’t know (or at least I don’t) if they have other ways of communicating. One ewe and her lamb, lying with their heads close together, made me wonder about that. 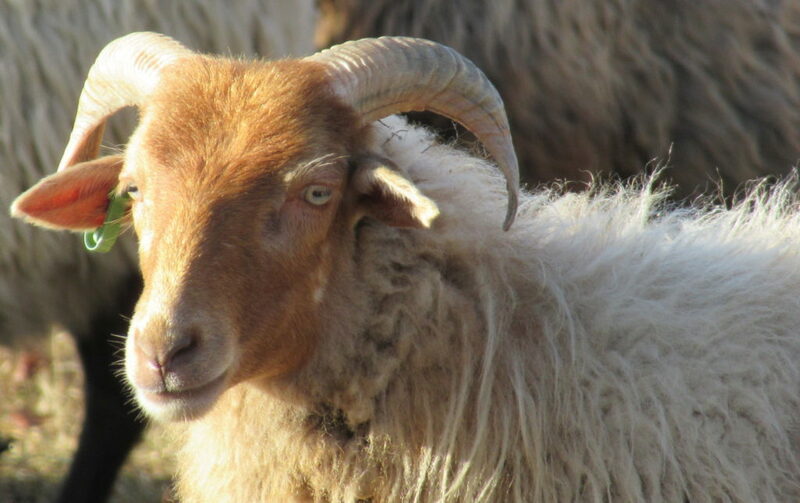 Do they communicate with other sounds besides bleating? They don’t seem to have many different facial expressions. But what about eye contact? Or perhaps they communicate in ways that we humans have no idea of. What a wonderful bicycle ride! It was no more than 45 minutes, but I’d seen so many lovely things. And although I hadn’t consciously been trying to solve the problem bothering me, just cycling along had solved it for me – I knew what I had to do when I got home. Apart from some cold and bright days like these, April has given us all sorts of weather. 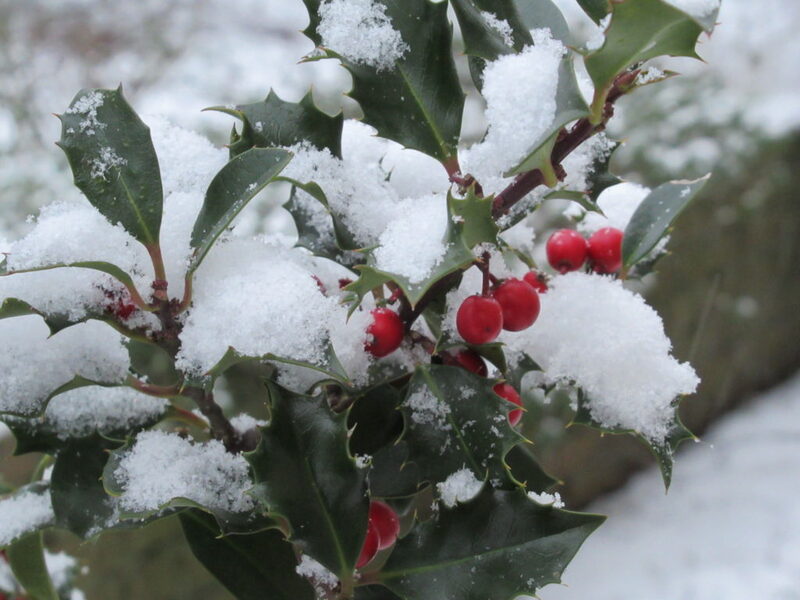 We even had an afternoon of snow and hailstorms! 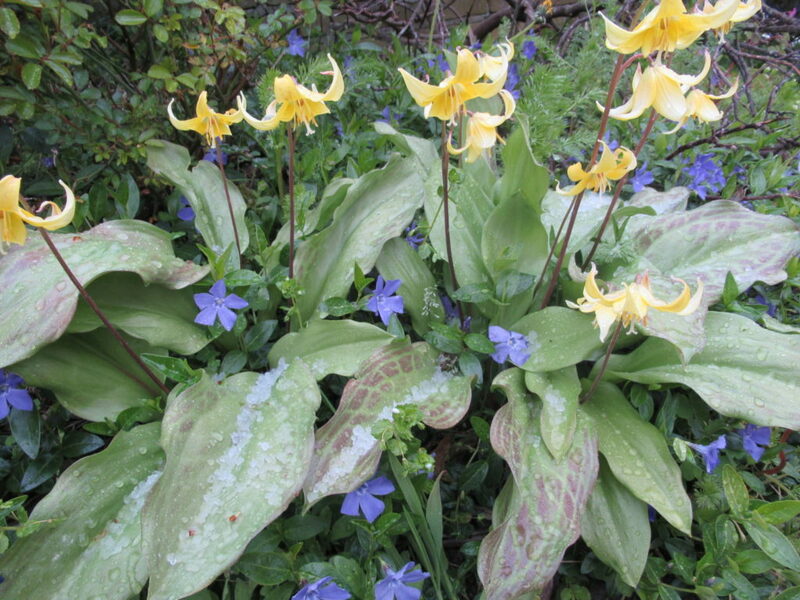 I don’t know if you can see it on your screen, but the leaves of these dwarf lilies in our garden are filled with hailstones. Last Sunday, the day after these wintry showers, was a little more spring-like. Not as warm yet as it is now, but really nice weather for a woodland stroll. I tried to get the stripes matching on both socks. I’ve tried to do that before, with varying success. 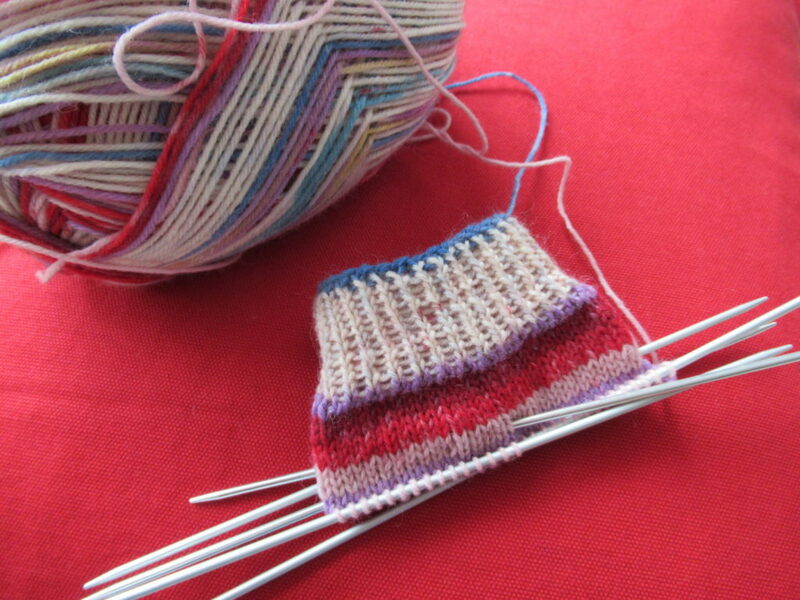 In theory, it should work if you find a clear place in the stripe pattern, note down where you are starting on the first sock, and start at the same place in the stripe sequence on the second sock. 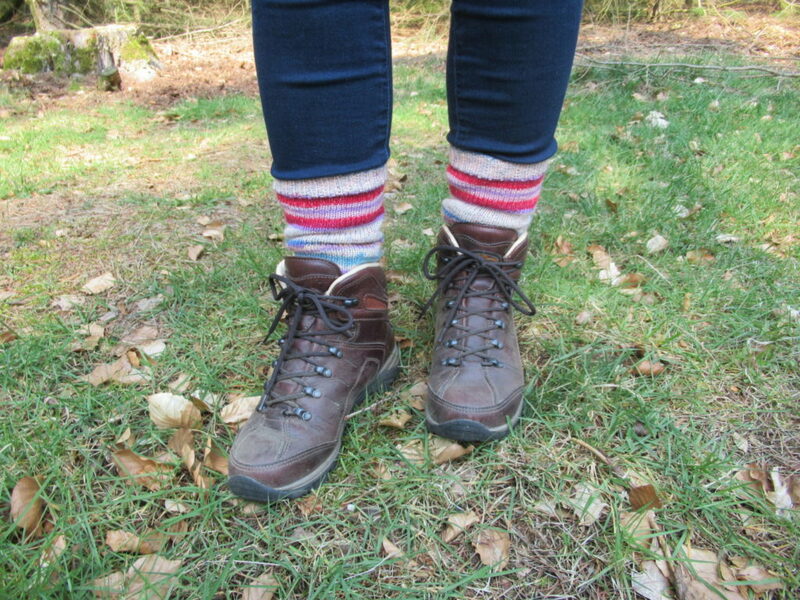 I give lots of socks away, being fortunate enough to have friends and relatives who want to wear them. But I’m keeping these. 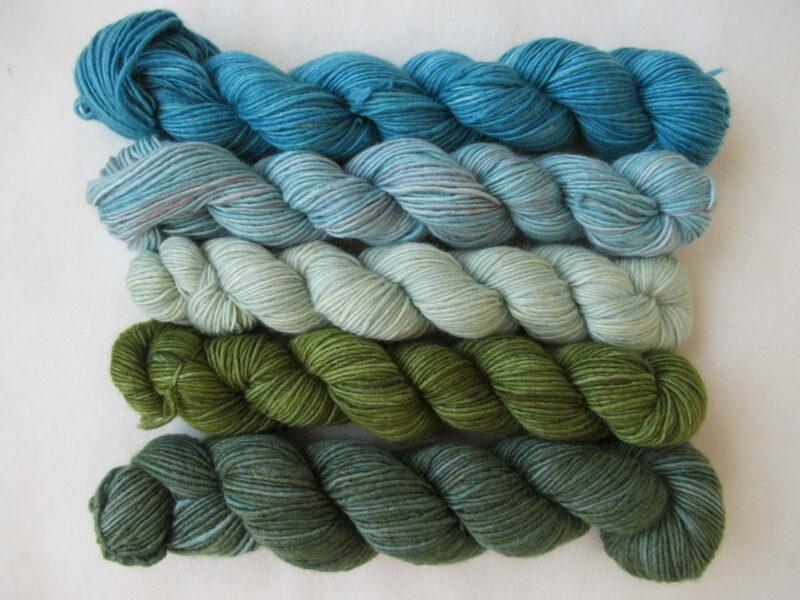 The yarn I used is Regia 4-ply in a colourway called ‘Nissedal’. 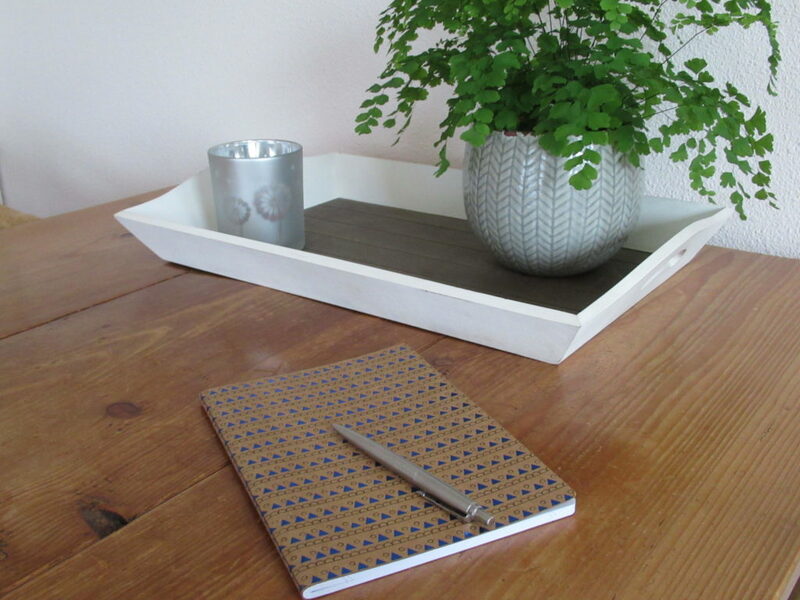 This stripe pattern was designed by Arne and Carlos, the sympathetic Norwegian guys (or is one of them Swedish?) who gained world fame with their knitted julekuler (Christmas baubles). 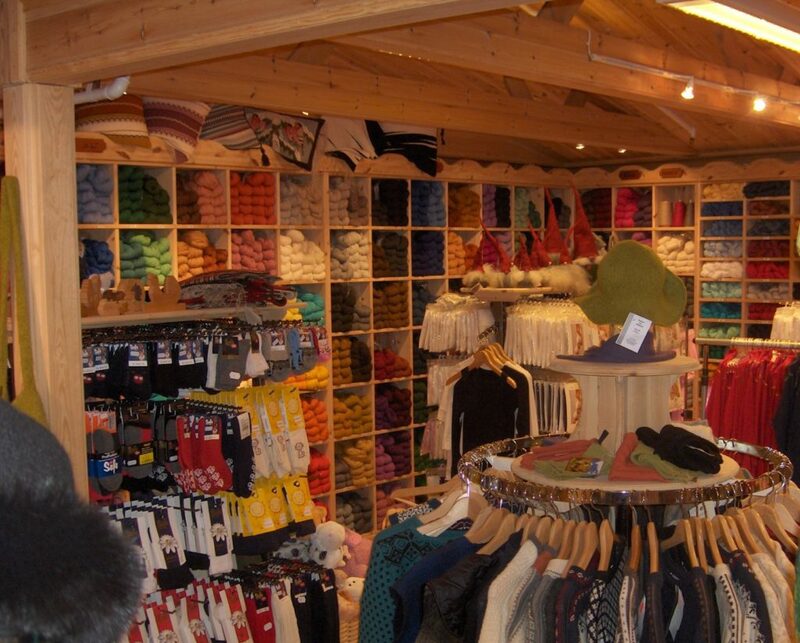 They’ve designed lots of other knits since then and have a YouTube channel with some 60.000 subscribers. I must admit that I’ve never watched any of their videos myself, but that’s not Arne and Carlos’ fault. It’s just that I’m not much of a video watcher in general. Some cushions have geometrical designs, others have intarsia flower patterns, and all of them have ‘Scandinavian knitting design’ printed all over, don’t you think? 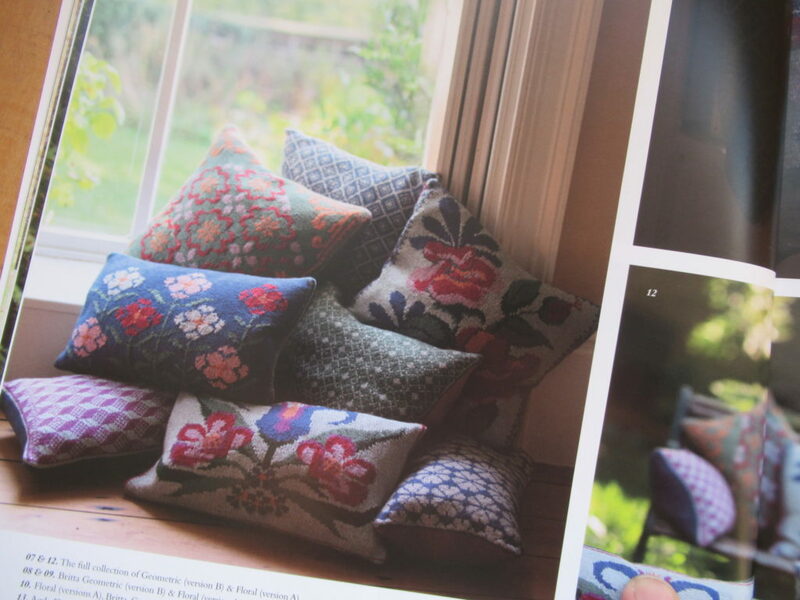 Word of Warning: Don’t buy this magazine just for the cushions, because the patterns are not included. 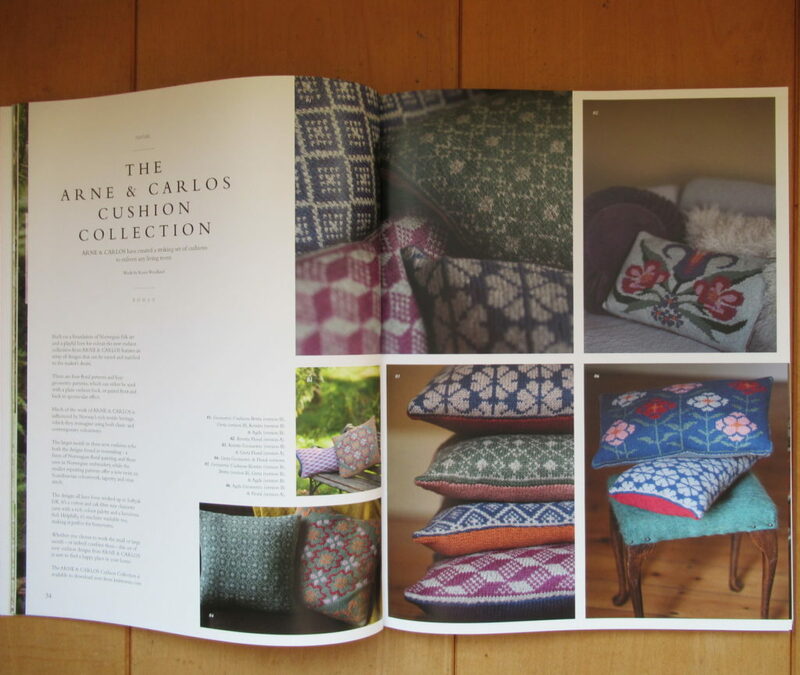 I don’t regret buying it, as it is filled with lovely spring and summer knits, including four designs for garments and accessories by Arne and Carlos. Everything is beautifully photographed, the patterns for all the other items are included, and I love leafing through it for inspiration. 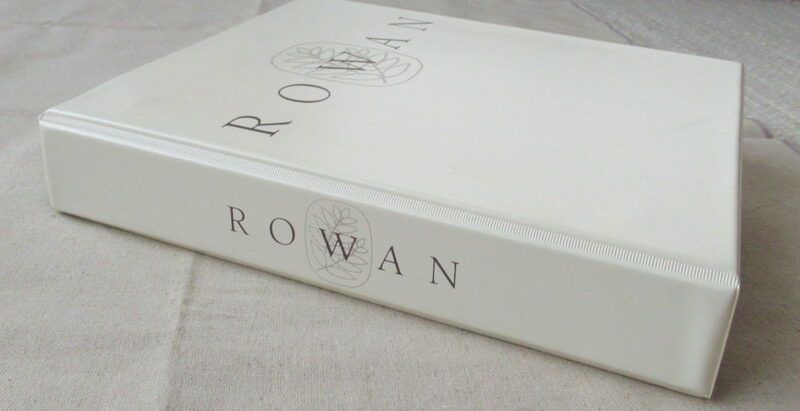 But the cushion patterns need to be bought and downloaded separately from the Rowan website. I’ve almost come to the end of what I wanted to show and tell you today. There’s just one more thing. I’ve finished knitting Granite, the cardigan for our daughter. I struggled with the right way to measure the stretchy knitted fabric, and was worried that I’d get it wrong. So I didn’t sew the pieces together yet, but just pinned them. … it fits! Yay! Can you see the pins sticking out at the armhole? Now there’s just the ends to weave in, the seams to join and the buttons to sew on. Well, that’s all for now. I wish you a lovely weekend. And if the weather is as spring-like in your part of the world as it is here, I hope you have plenty of time to enjoy it. On Sunday morning we decided on a whim to pay the shepherds of Balloo a visit. It was a lovely day for a walk and I hoped we would see some newborn lambs. When we arrived, the doors of the sheep fold were open. We could see that it was empty and the sheep were out, which was only to be expected in the middle of the day. In 2011, the old fold was destroyed by a terrible fire. 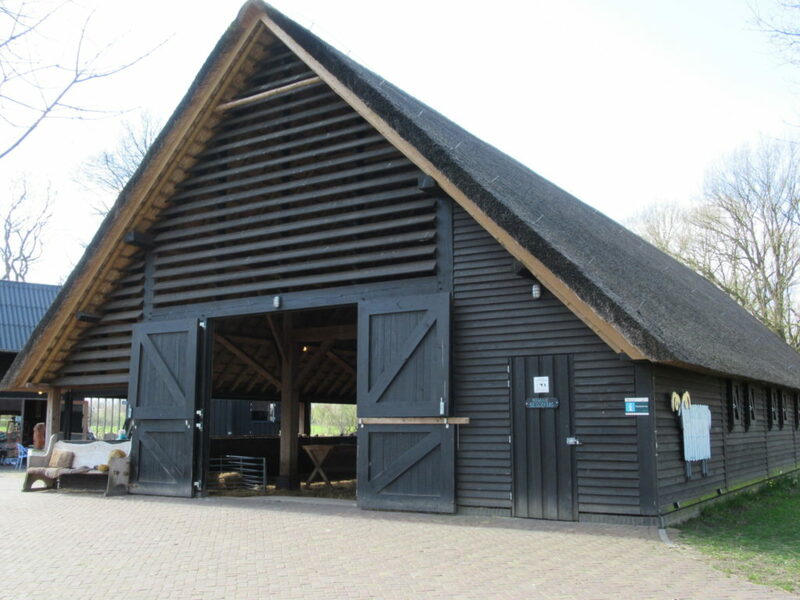 Fortunately, enough money could be raised to rebuild, and there is a new, very light and airy fold now. 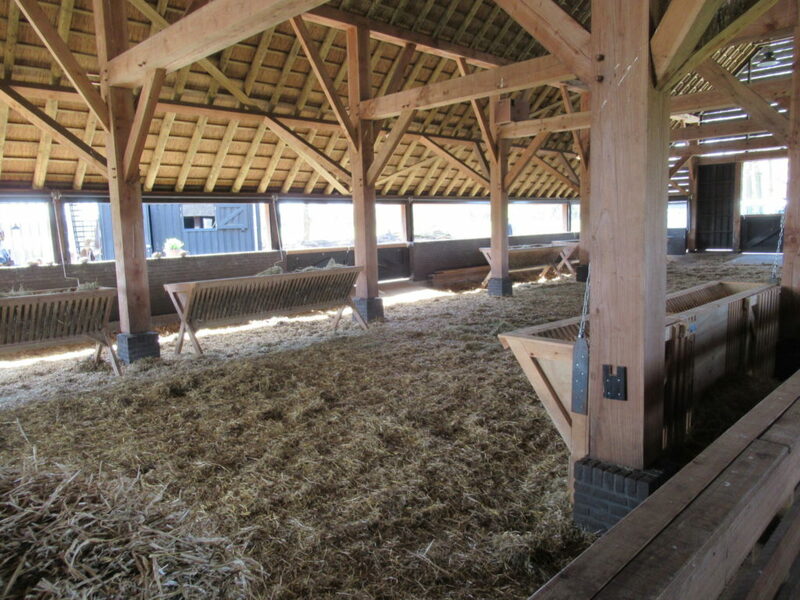 Looking inside we could see the fresh, golden straw on the floor and the wooden feeders filled with hay. In cold and wet weather the ‘windows’ can be closed with a kind of roller blinds. 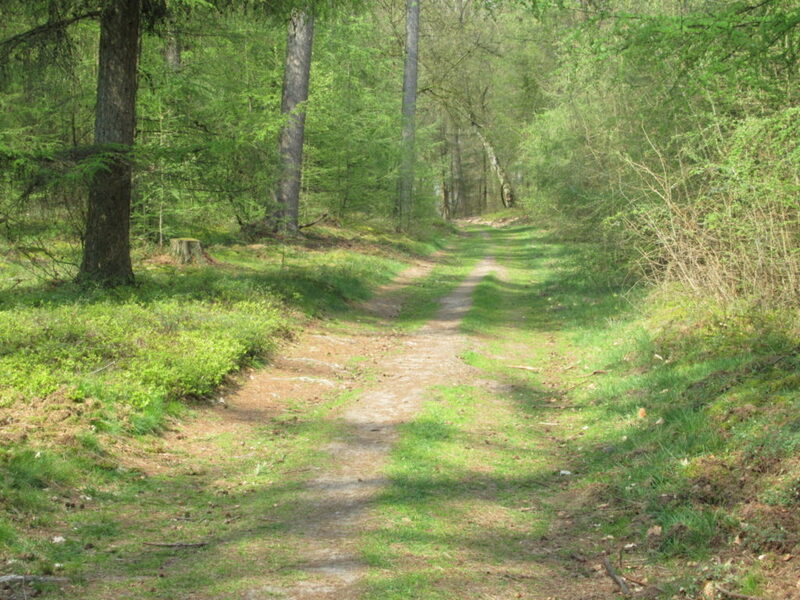 Very soon we turned right, onto a sandy path and the heath. 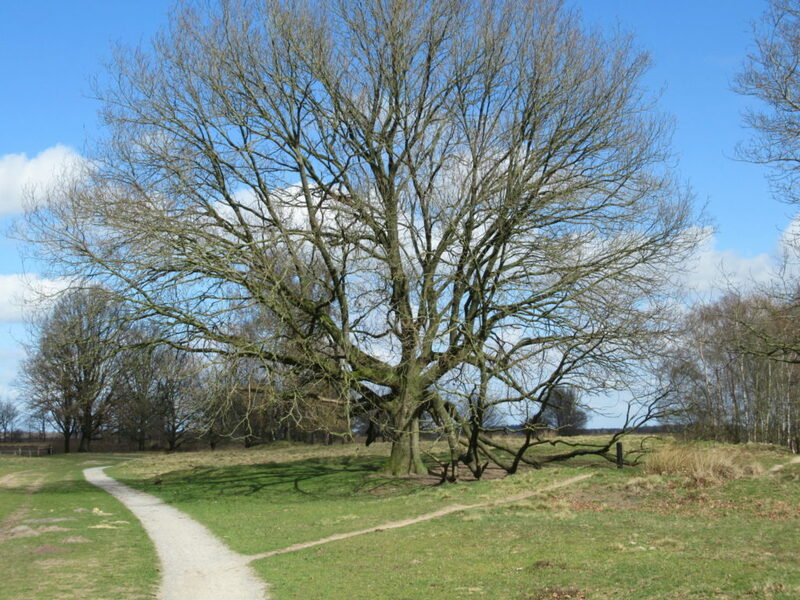 Although spring has arrived in our garden, the landscape here still looked bare and wintry. I haven’t discovered how to share the sounds and smells of our walks with you here other than catching them in words, so that’s what I’ll try to do. 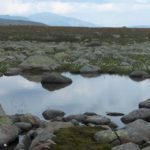 Well, I don’t know about the smells, but for a soundtrack to this walk think of the soughing of the wind and the song of skylarks, climbing higher and higher into the sky. Nothing else. No cars, no planes, no traffic noise at all. Walking on, we lost sight of them for a while. Why? Well, in my pictures the landscape looks flat, while it is in fact slightly undulating. But soon enough, climbing a hillock, we suddenly saw them again. And sitting in a sheltered spot, leaning against his rucksack, was one of the two shepherds who own this flock, keeping an eye on his sheep. 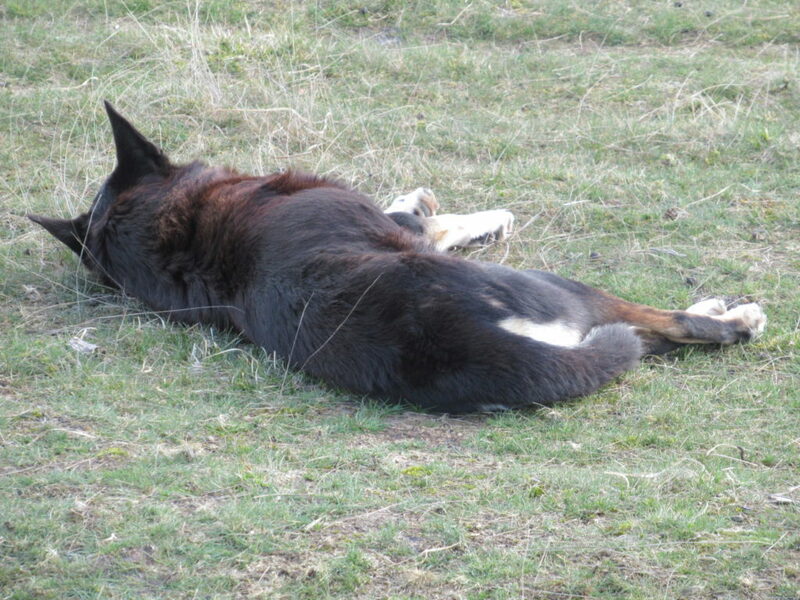 The shepherd told us that Woods is a dog with a natural instinct for herding. A really reliable dog. ‘If we get back to the fold at the end of an afternoon and Woods keeps looking back, you can bet your boots that there’s a stray lamb left behind,’ he said. 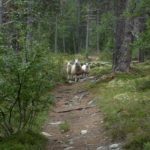 Talking about lambs – where are they? Well, as it turns out we were a bit early in the year. There were only six lambs as yet. 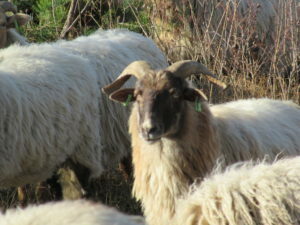 They were hidden among the adult sheep, but I was able to take a snapshot of two of them. Can you see them? 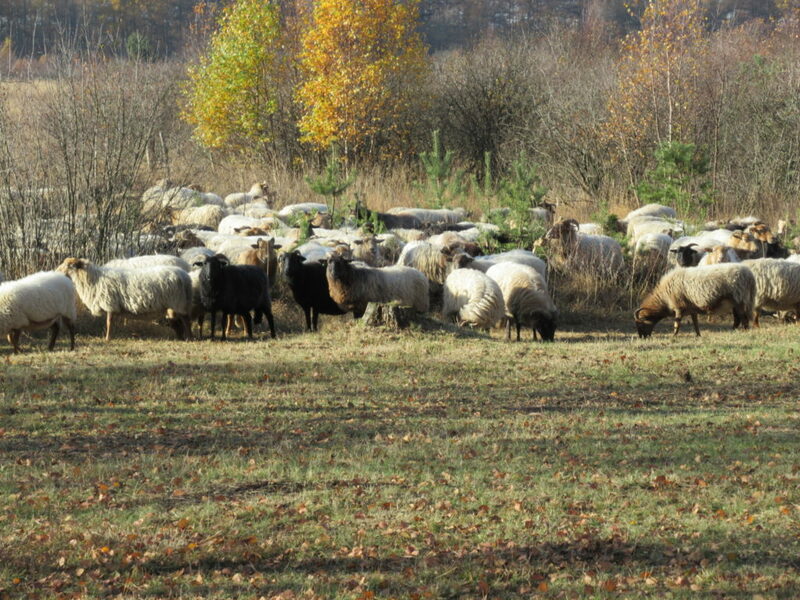 These sheep are again of the Drenthe Heath sheep breed, about which I wrote in A Chat with a Shepherd. And here, too, their main job is nature conservation. 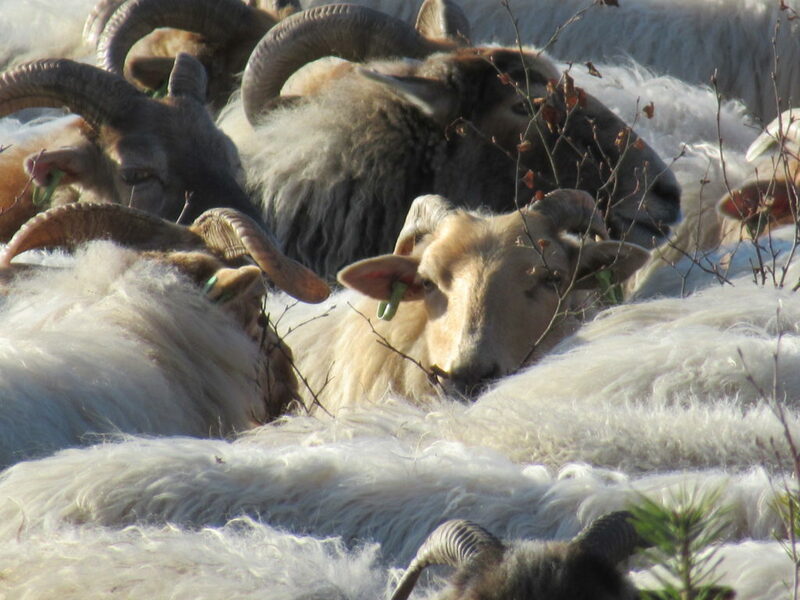 The shepherds of Balloo have the biggest flock in this part of the country, with over 400 sheep before the lambing season. 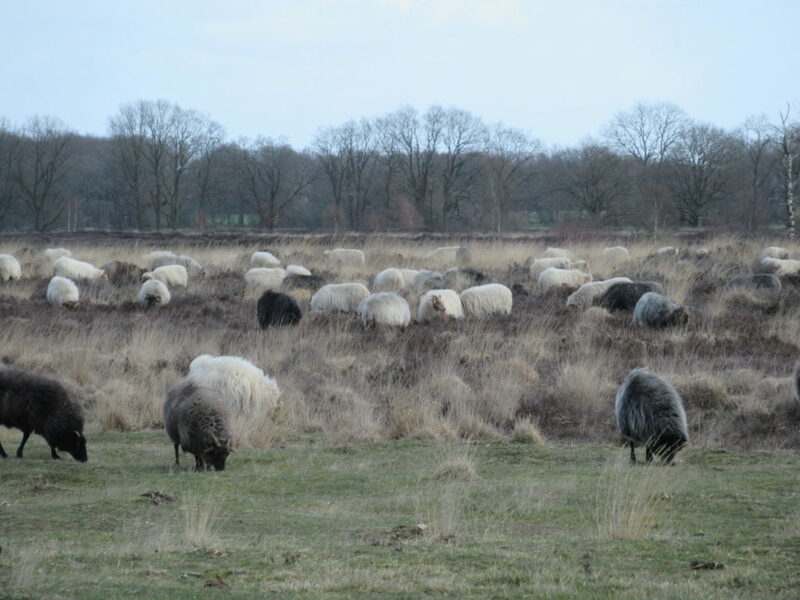 As is usual for Drenthe Heath sheep, their colours range from (almost) white to black, with other colour variations in between. What interests me, of course, is what happens with the wool. In the Middle Ages wool was an economic factor to be reckoned with, and the wool trade brought great riches to parts of Europe. But we live in different times. 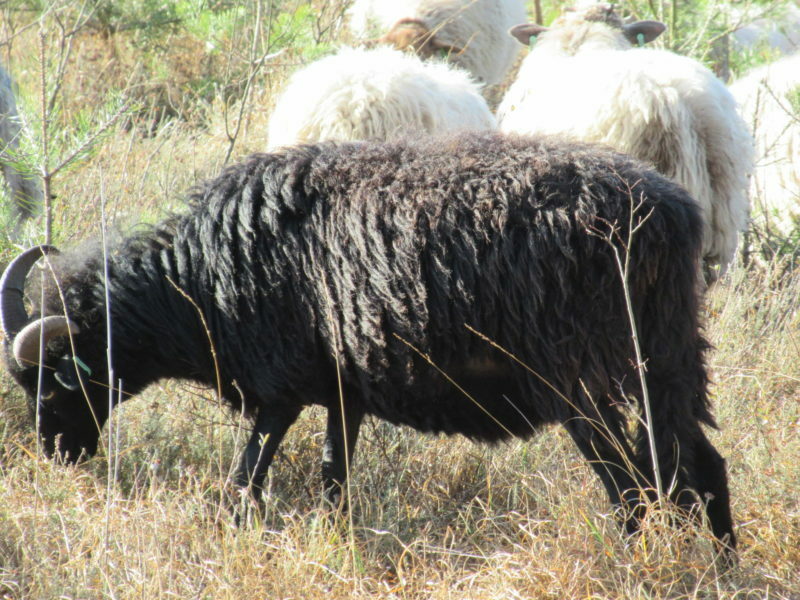 At my knitting group, last week, I was shocked to hear that another shepherd with Drenthe Heath sheep receives literally nothing at all for his fleeces! His fleeces are shipped to China, as some kind of waste product, to be used in the carpeting industry. At Balloo things are looking better, I’m glad to say. Along one wall of the fold I saw stacks and stacks of plastic bags filled with fleeces. 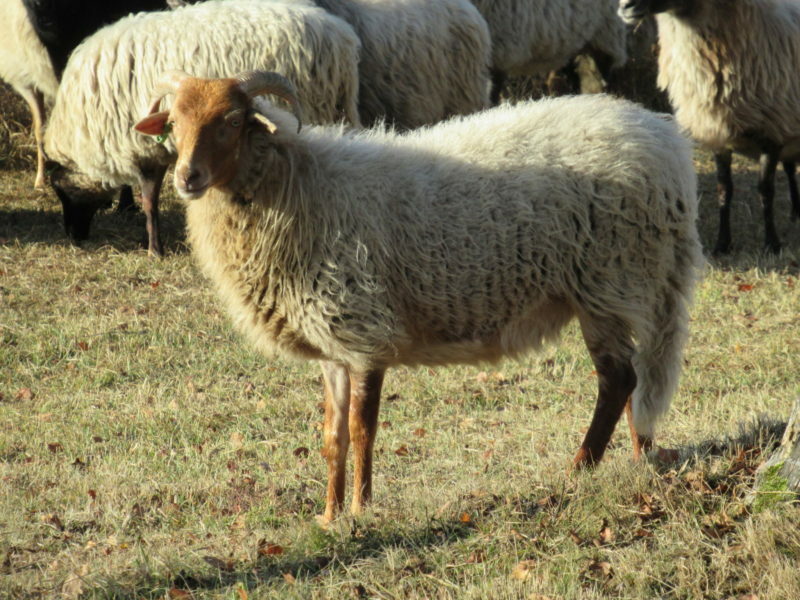 Fleeces in all of the colours Drenthe Heath sheep come in are offered for sale. 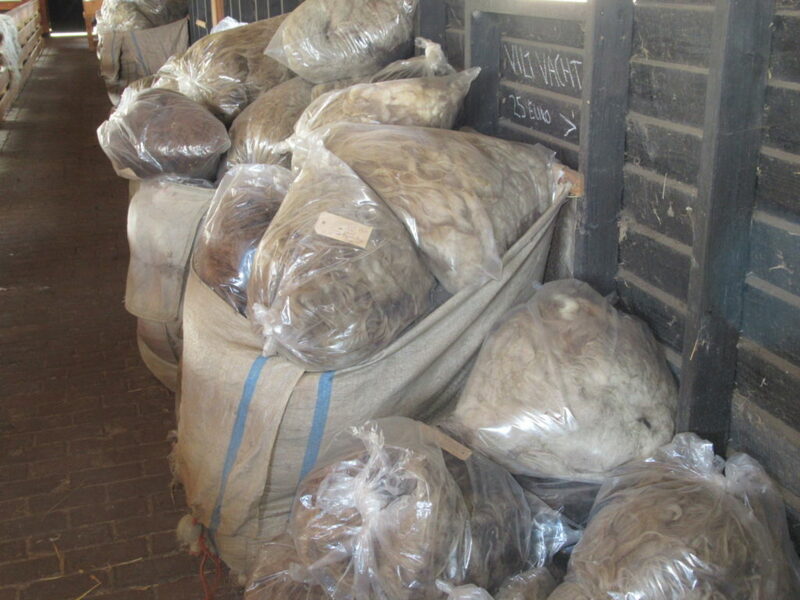 Each bag has a label describing the specific properties of that particular fleece. 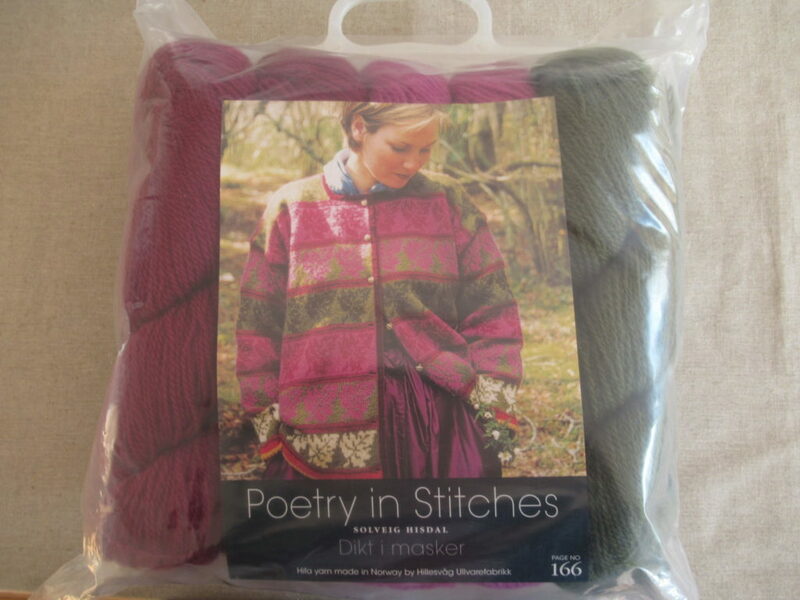 I read things like: ‘Ideal for felting’, ‘Good quality for spinning’, ‘Fleece with especially long locks’, etcetera. An entire fleece would be too much for me, at the moment, but fortunately I was able to buy a smaller quantity of wool. I am looking forward to trying out how it feels in my hands and how it spins up. I need to finish spinning and plying some other wool on my bobbins first, but when I have something to show, I’ll definitely let you know. 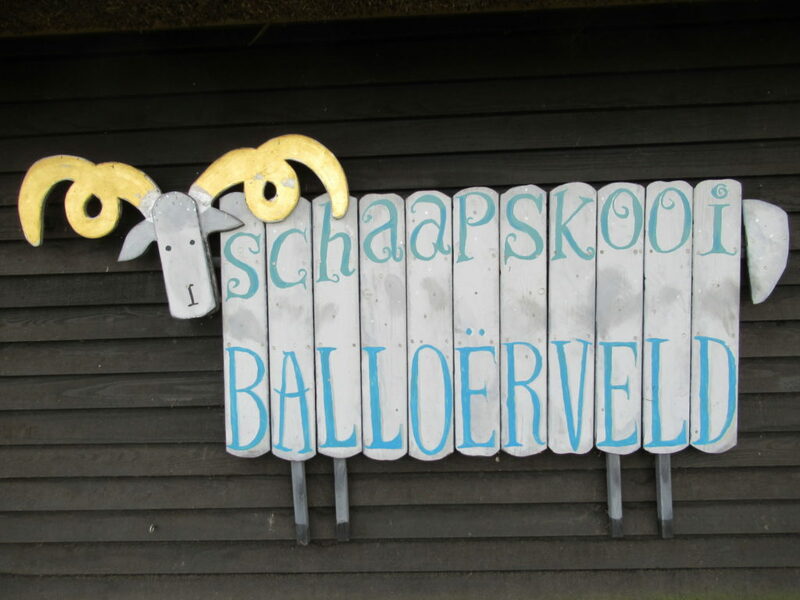 There are two websites dedicated to the Balloo sheep. I don’t quite understand why. One seems to be the shepherds’ own website, and has information about the flock and the wool studio (more about that some other time). 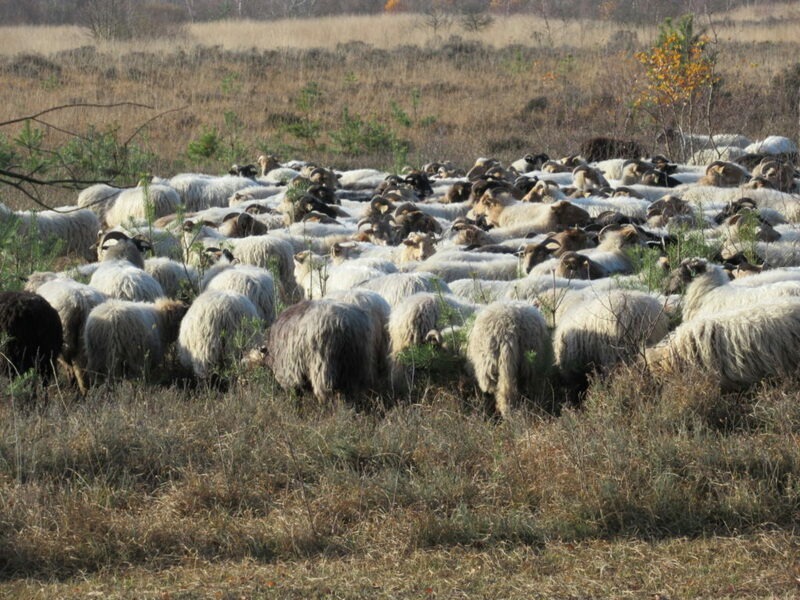 The other website provides similar information about the flock, as well as a description of the landscape. Right now, life around us looks a bit like relay race. As soon as one person recovers from the flu the next one takes over the baton, and starts coughing and feeling headachy. And then the next one. For those of you who are reading this with watery eyes and a box of tissues close to hand: I wish you a speedy recovery! I’m more or less back to normal, so I thought I’d give you the knitting update that I promised last week. It’s all about simple knits right now, nothing spectacular (is knitting ever spectacular?). I’m glad that I have several things in this category on my needles. First of all there is ‘Granite’, the cardigan that I’m making for our daughter. Although I don’t feel like I’m spending huge amounts of time knitting, it is progressing much faster than I’d expected. I’d hoped to have it finished before the autumn, but if it goes on like this, she may even be able to wear it later this spring. The back, both fronts and one sleeve are done. There’s just one more sleeve to knit. Measuring the length of the pieces is quite hard, as they stretch enormously in every direction. I’ve measured the first sleeve again and again, and the tape measure indicates a different length every time. I’ve also counted the number of rows I knit and compared them to my swatch. 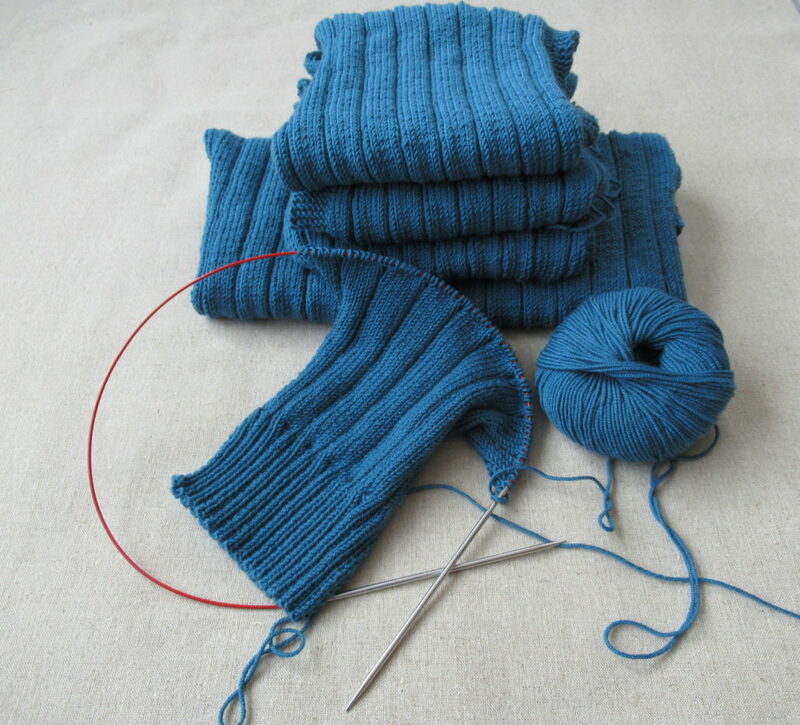 For the sleeve, for instance, I need to knit 40 centimeters from cuff to start of sleeve cap. 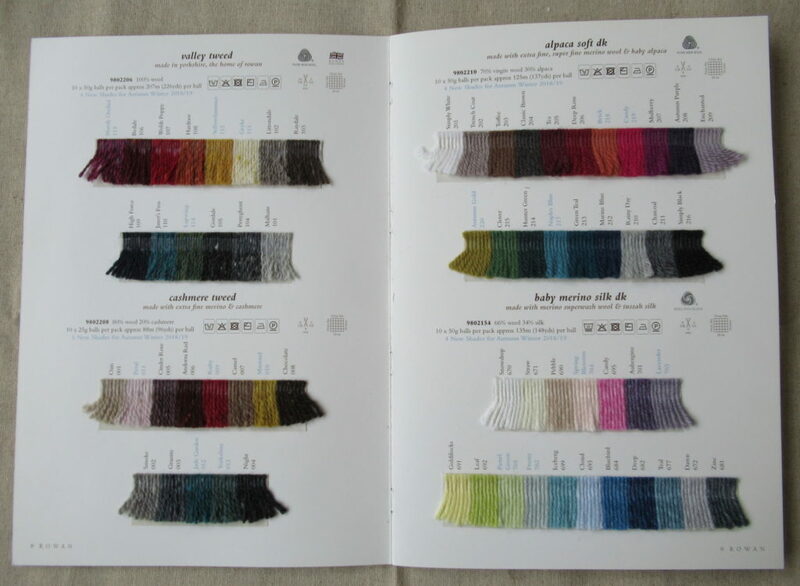 In theory that is four times the number of rows of my 10 cm swatch. But in reality that looks way shorter than it should be, and that’s what my tape measure tells me too. Well, I’ve done my best and hope that back and front, and especially the sleeves are going to be the right length. I usually buy the buttons first and then adapt the button holes to them. But because I was unable to go out, I’m doing it the other way round this time. 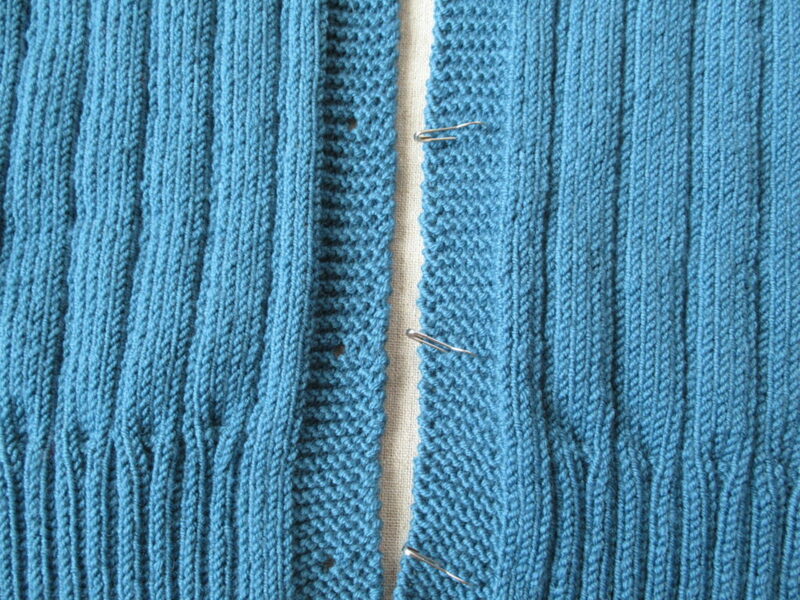 I’m knitting the buttonholes as indicated in the pattern and hope that I’ll be able to find matching buttons. In this case I do want both socks to be alike. 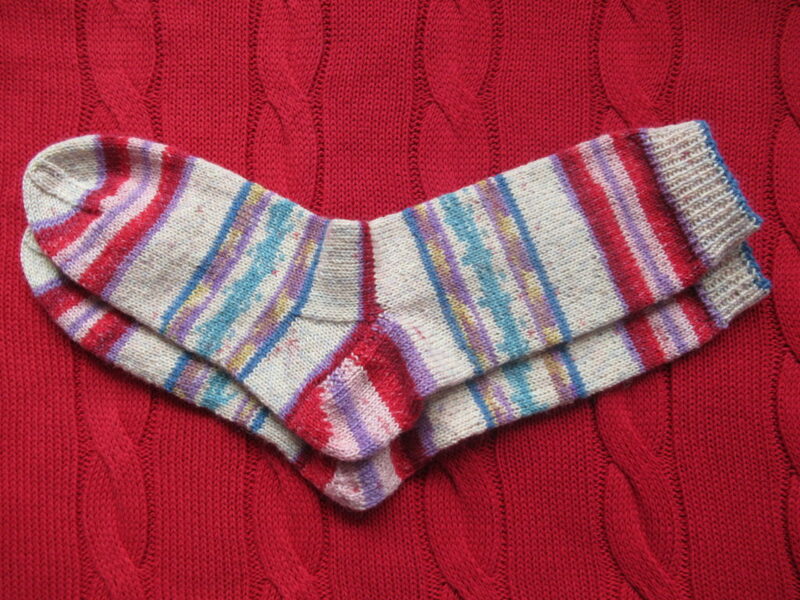 Nowadays some of these yarns have a special starter thread that helps create two identical socks, but my yarn doesn’t. So what I’ve done is I’ve chosen a clearly recognizable part in the stripe pattern (the narrow blue stripe bordering the part with the turquoise in the middle) and started with that. 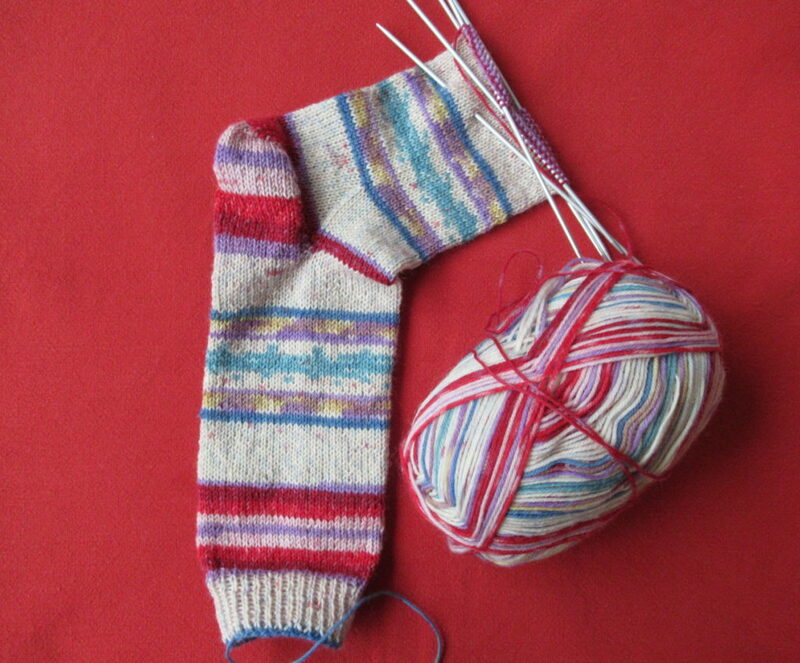 I hope I can replicate that on the second sock. I have a confession to make. 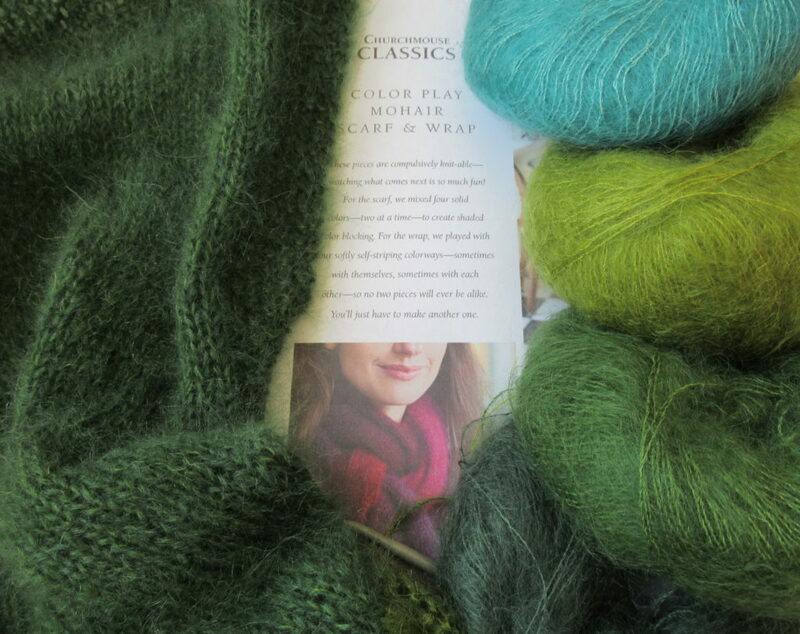 My scarf in four colours of mohair and silk was meant to be my take-along project. The idea was that I would knit the memories of places I’d been to into it. But I’ve cheated and also knit a bit at home. I wasn’t going anywhere for weeks on end, and I just couldn’t keep my hands off it. Apart from that, it has accompanied me on an outing with our daughter, a visit to friends in the south of the country and to my knitting group on Wednesday, where I added in the next colour, the bright turquoise on the right (I took the photo beforehand). In this scarf, two colours are knit together in every ‘block’. This means that the scarf as a whole will be less bright than the yarn on the ball, and that the colours blend nicely together from one block to the next. 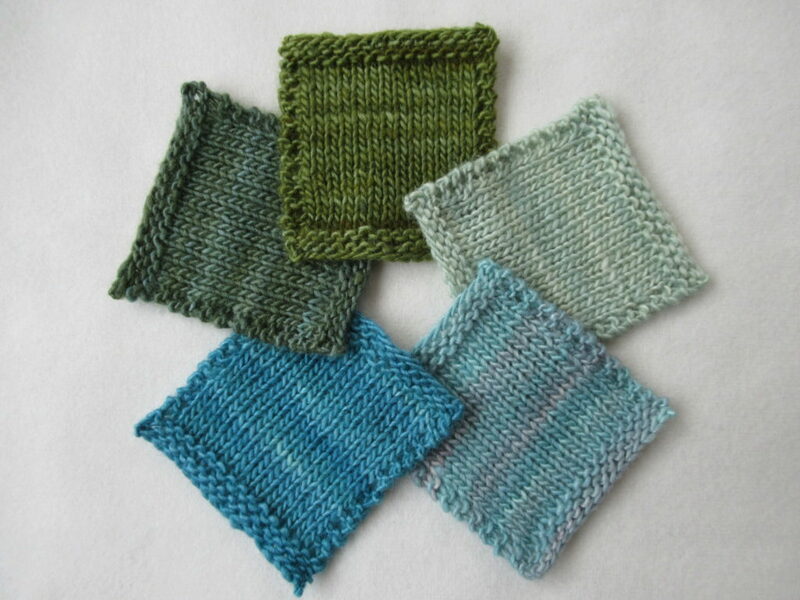 And last but not least, I’ve been knitting some swatches in an absolutely BEAU-TI-FUL yarn. 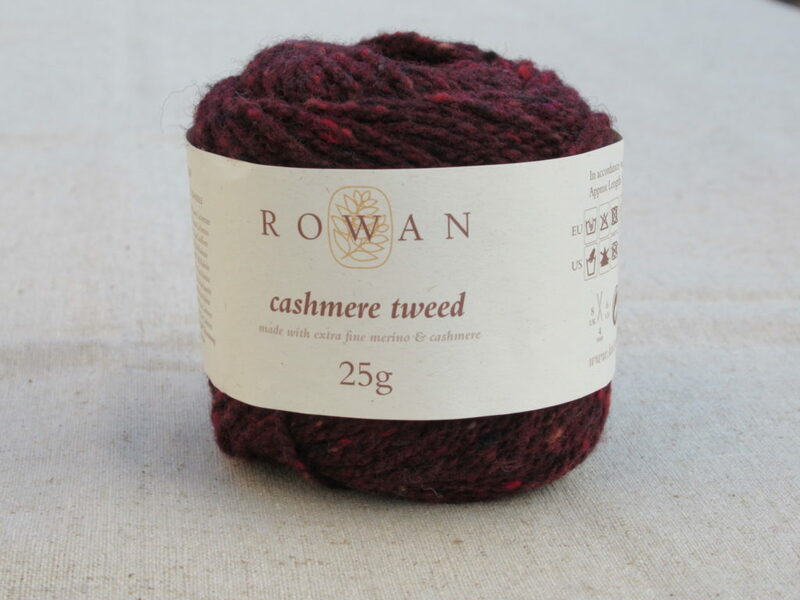 This fairly thin yarn is soft, has a slight gleam and comes in a range of lovely colours. I hope to tell you more about it soon. Nothing new on the knitting front this week, I’m afraid. 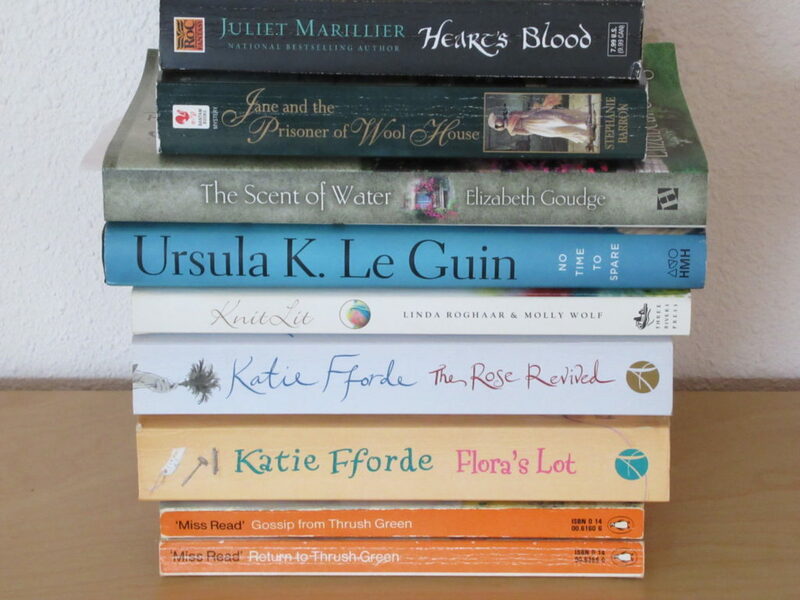 I’m down with the flu, unable to put a blogpost together. I just thought I’d let you know. I hope to be back here next week. 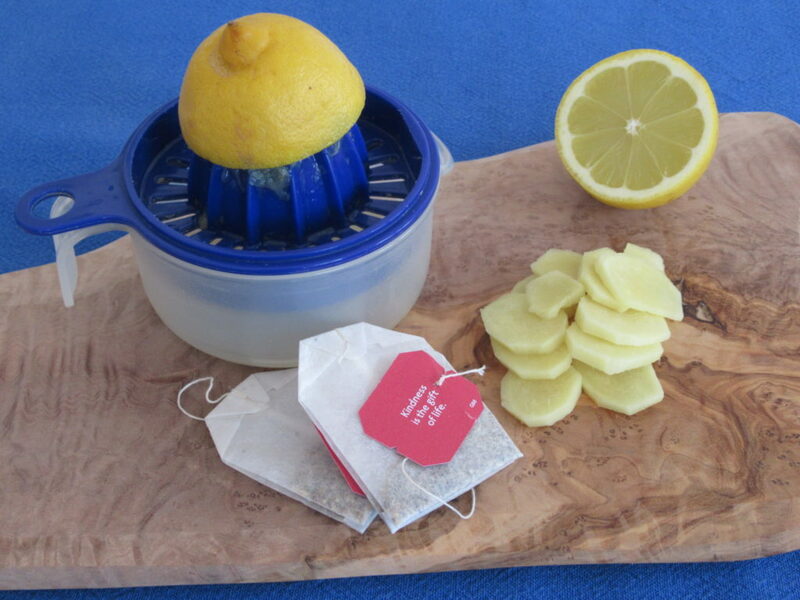 If you’ve also been hit by the flu, take good care of yourself and get well soon! Hello! 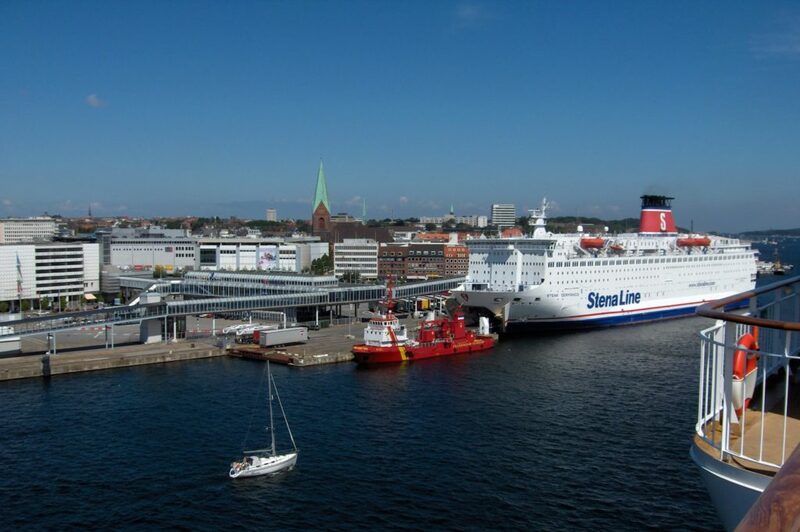 Welcome on board the ferry from Kiel, Germany, to Oslo, the capital of Norway. Today we’re travelling back in time to 2006. The year our family of three spent a Summer Holiday in Norway. 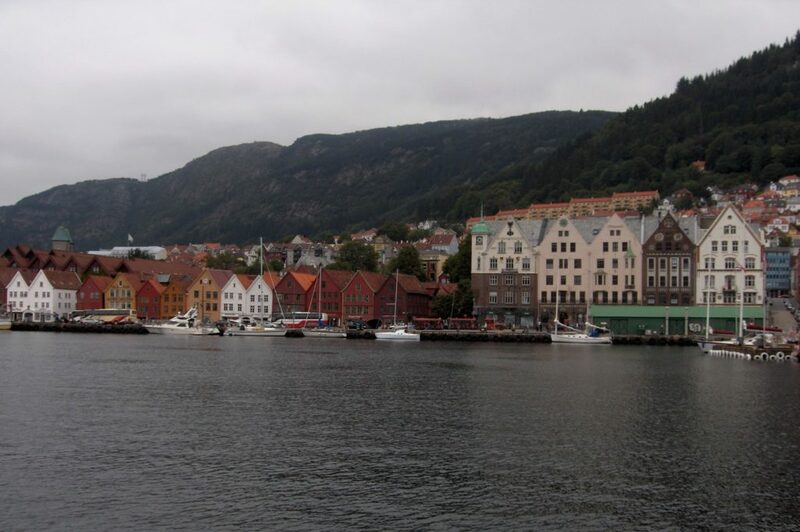 One of our destinations is a spinning mill on the west coast, a little north of Bergen. But before we get there, we’ll be seeing some sights along the way. 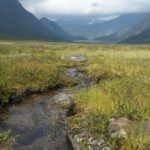 I won’t bore you with our complete family photo album, but I do want to show you a bit of this beautiful, rugged country that has such a great knitting tradition. 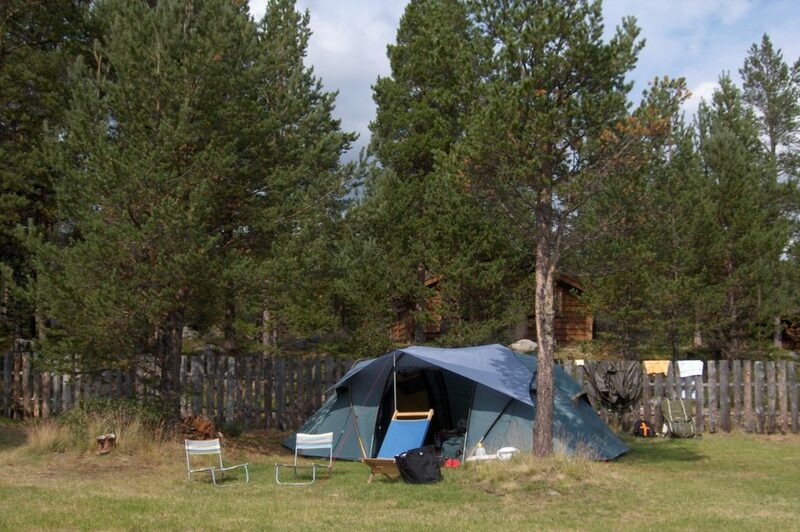 Our accommodation for most of this holiday is a tent. It isn’t big, but it’s comfortable. And we’ve even brought some chairs. 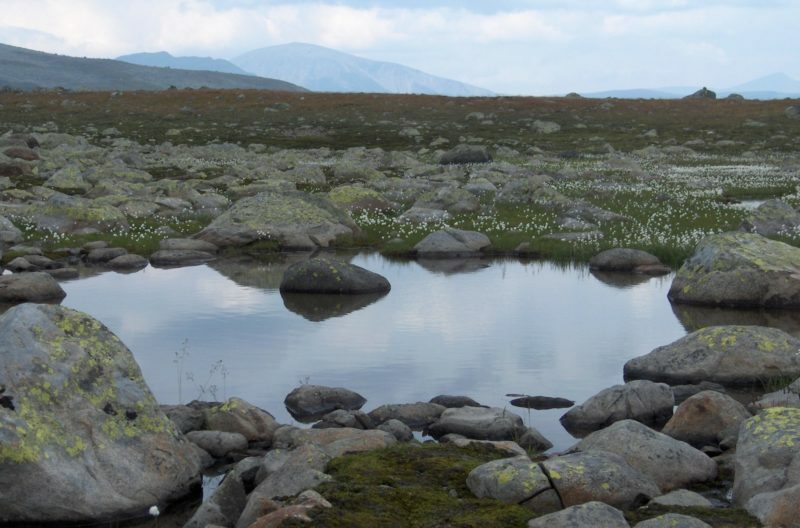 From Oslo we are first travelling north, to Jotunheimen National Park. 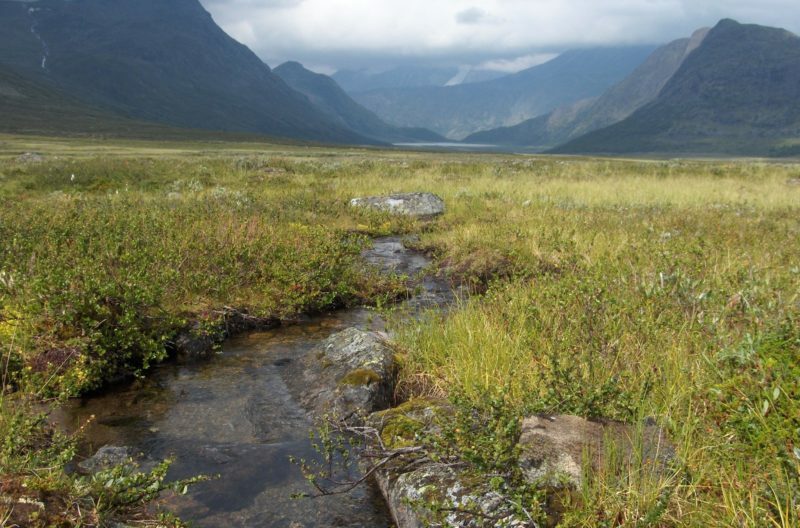 This mountainous area is ideal for hiking. 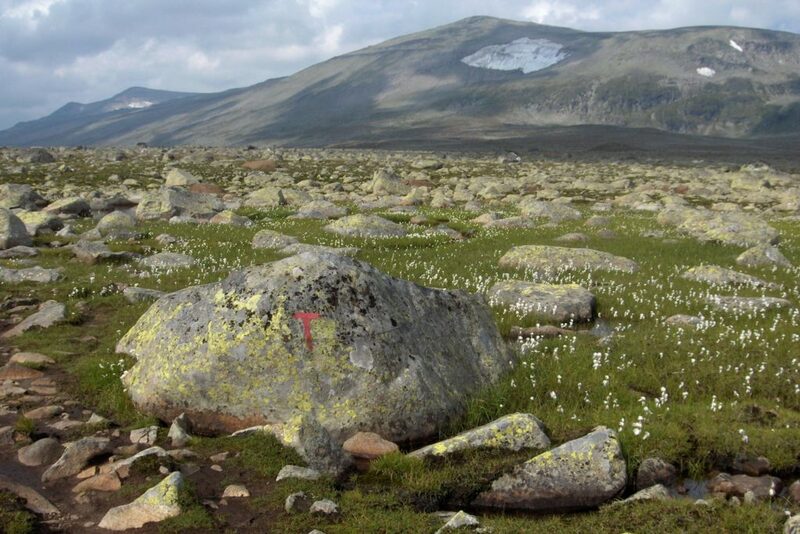 There are miles upon miles of hiking trails, the main routes clearly marked with big red T’s on rocks. I hope you’ve enjoyed these walks and are not too stiff and sore from the unaccustomed climbing. 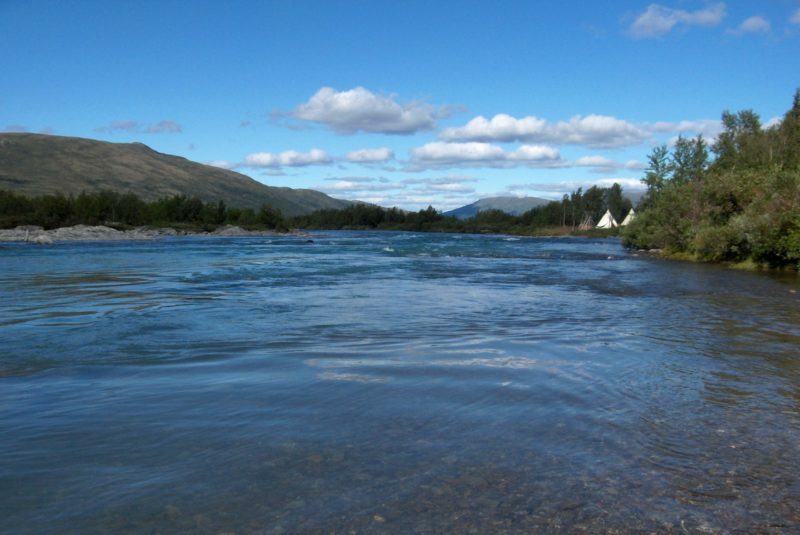 Leaving Jotunheimen, we’re now travelling in a southwesterly direction. 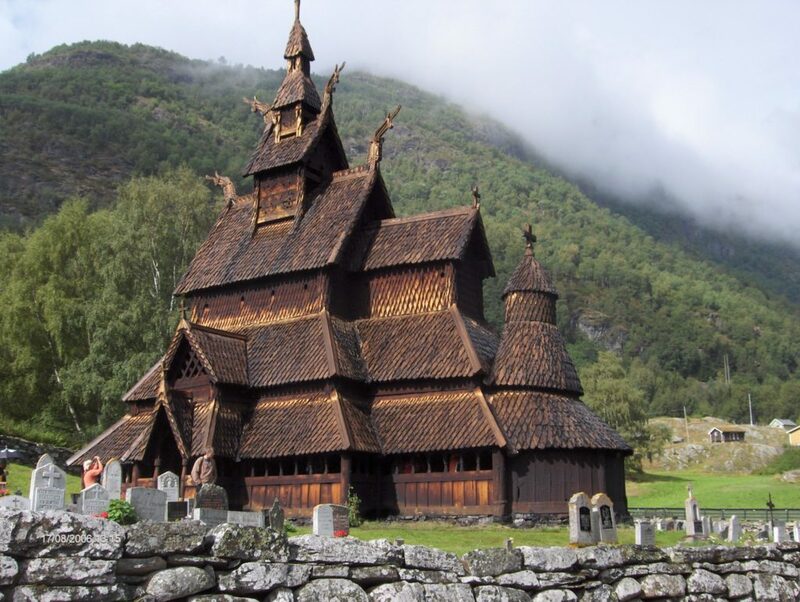 At Borgund we visit a stave church from around 1200 AD. The roof of this wooden building is decorated with both dragon’s heads and crosses, and there are intricate wood carvings around the entrance. Inside it is rather dark, as the windows are small. The wood is charred and tarred for preservation, which gives off a very special smell. We’d heard the joke and decided to rent a cottage in the area instead of putting up our tent again. 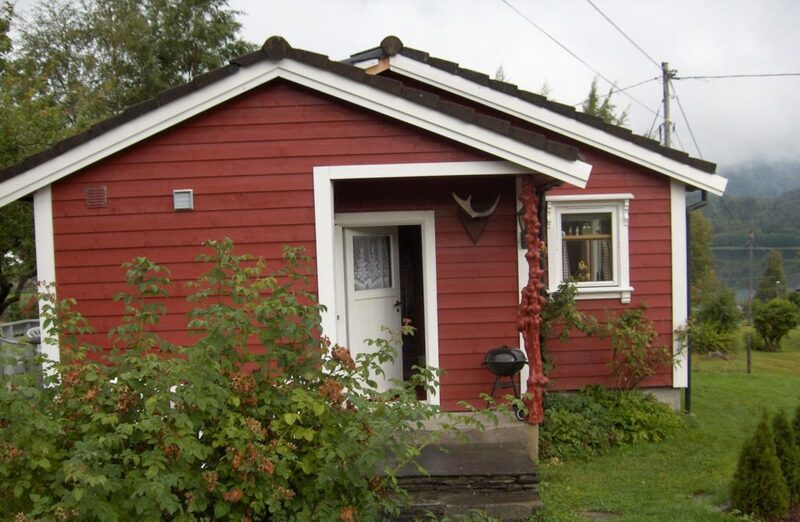 It is painted in Scandinavian red and one corner of the roof is supported by a knobbly tree trunk. Inside everything is made of unpainted wood – the walls, the floor, the furniture. On our menu is a lot of salmon, as well as Pytt i Panne, a traditional one-pot dish with potatoes, leeks and ham. 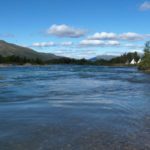 From the cottage it is only a short drive north to Hjelmås, where we are going to visit a spinning mill, called Hillesvåg Ullvarefabrikk. 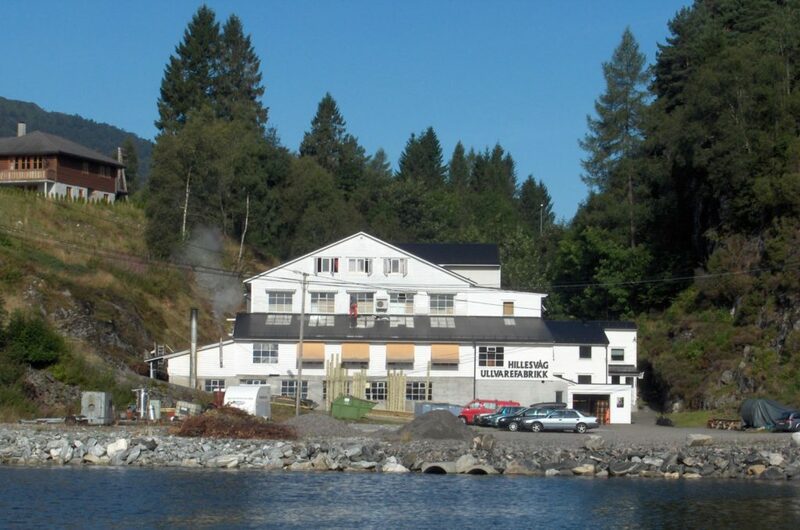 Hillesvåg Ullvarefabrikk was founded in 1898. Some of the machinery from the early days is still in use. The front door of the building opens right into a small shop brimful with yarn and ready-knit socks, woollen underwear and sweaters. 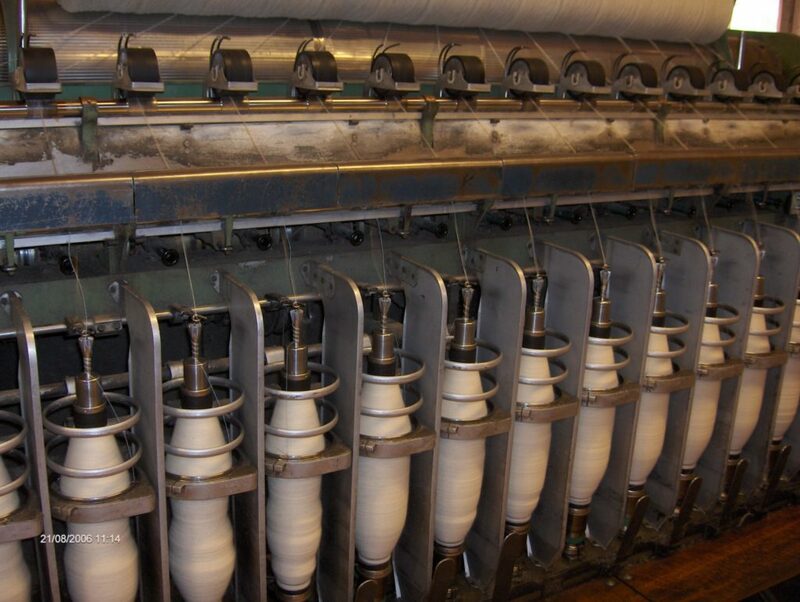 We ask the lady behind the counter if we could, perhaps, take a look around the actual mill to see the yarn being spun. ‘Of course,’ she says, and she calls the general manager, who kindly gives us a tour of the premises. He tells us that all of the wool they process is from Norwegian sheep. 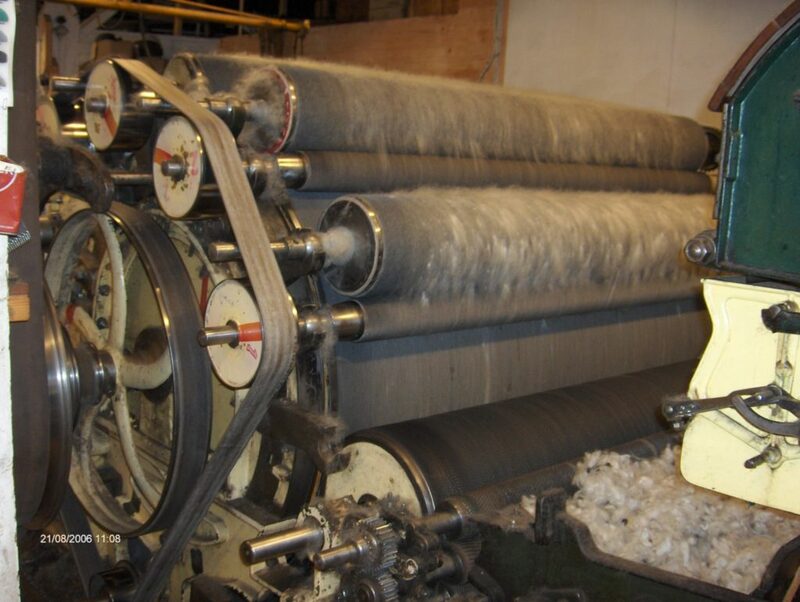 … and is carded by roll upon spiky roll to align the fibers, and produce a sliver ready for spinning. 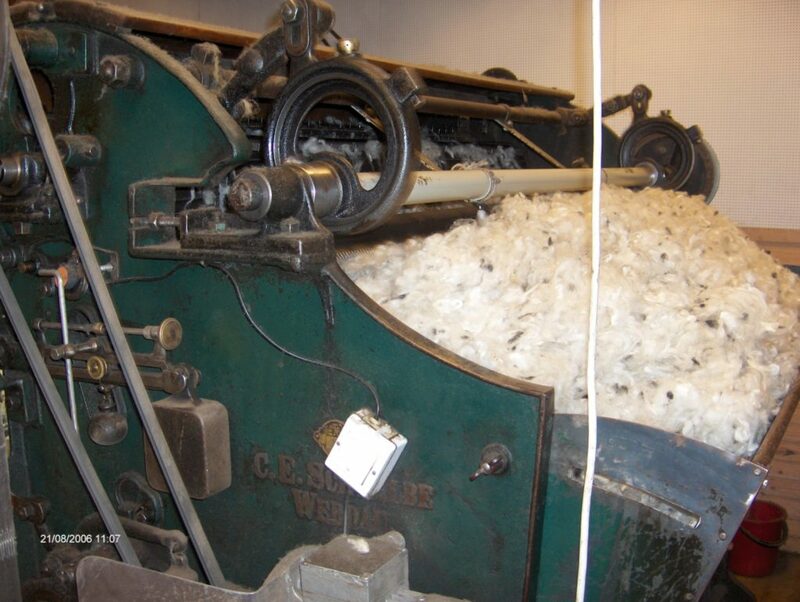 Then we see how the carded wool is spun onto yarn spools. Back in the shop it’s time for another look at the colourful yarn display. 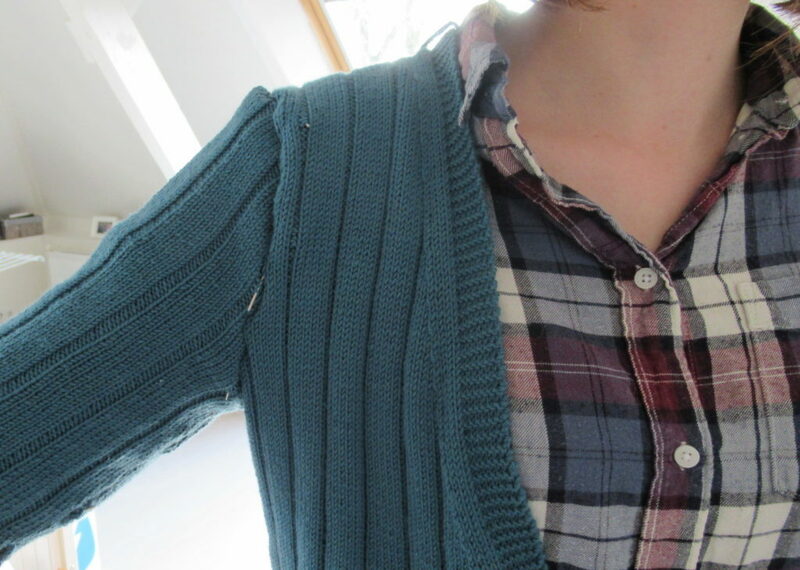 After much deliberation, I finally decide to buy the kit for the ‘challenging’ cardigan I mentioned in my previous post. Nowadays, Hillesvåg Ullvarefabrikk is an Economusée, which means that they are still a working mill, but now officially give guided tours. Well, it’s high time to get back on the ferry for the return journey. I hope you’ve enjoyed your mini-holiday in Norway. Thank you for travelling with Merula Designs and I hope to see you again soon. 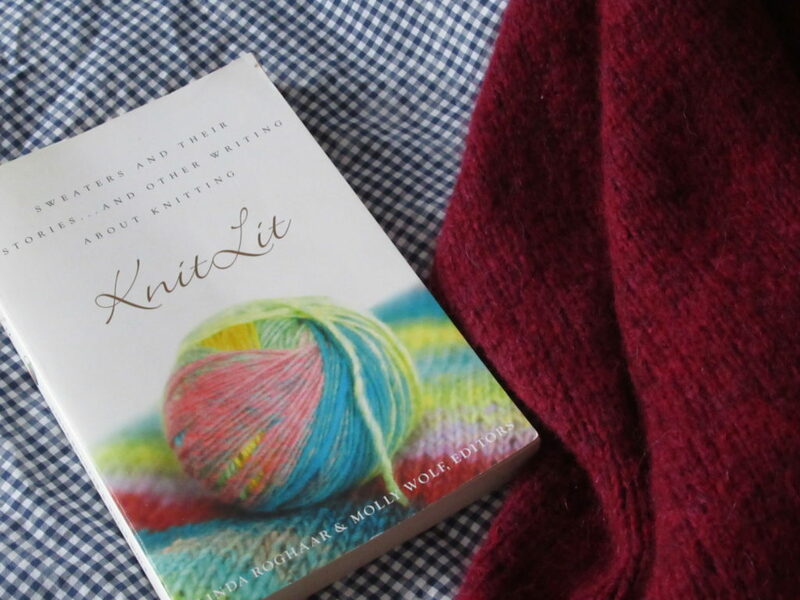 The title of this blogpost may suggest that this is some sort of manual telling you how to choose your next knitting project. Well, it isn’t. It is a question that I’ve been asking myself lately. In reality, the question was more like: How ON EARTH am I going to choose what to knit next?????????? Going by what I see and hear around me, there are more people struggling with this question from time to time. It’s a luxury problem, of course. Our grandmothers knew what they had to knit to keep their families warm – not much to choose there. But we live in different times. 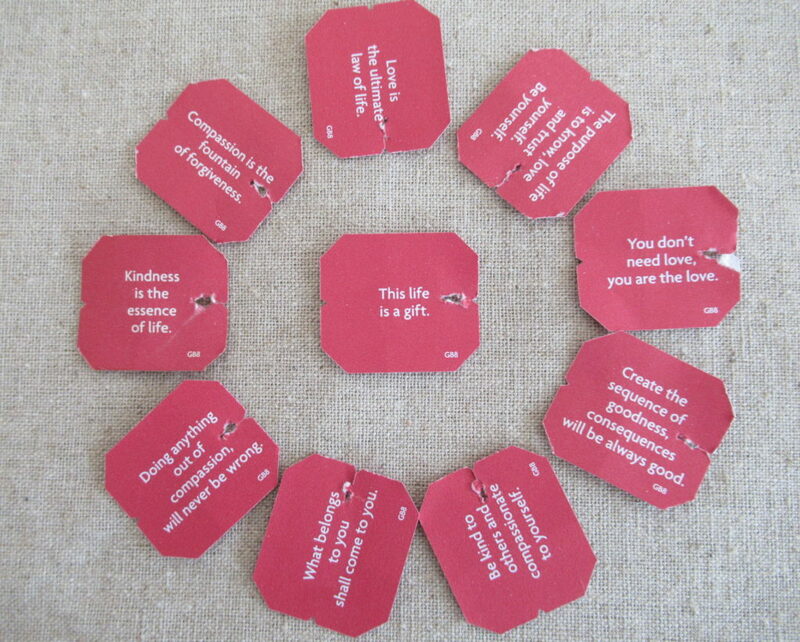 Our problem is often that we have too much to choose from. Besides, a knitting project can be quite an investment of time and money, so it’s only logical that we want to make the right decision. I’d love to give you a step-by-step plan, but I can’t. I’m no master of choosing, and I have no idea what works for others. I can only tell you what I did to find the answer, and hope that’s somehow interesting or helpful. 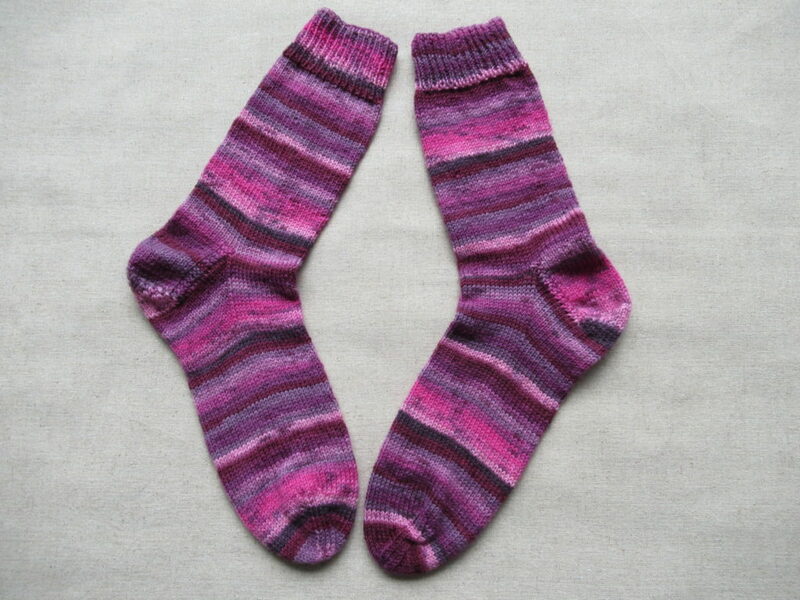 If you’ve been following my blog for a while, you may remember that I’d come to a point when there was nothing on my needles except a pair of socks. 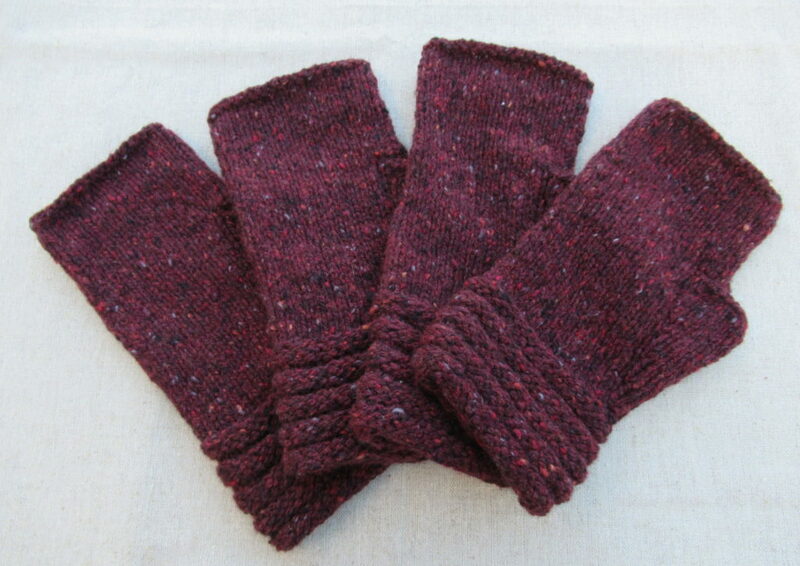 And when I’d finished those, there was nothing on my needles at all. I hated that. I felt very uncomfortable with it. And yet, I was unable to cast on something new. Why? To find the answer, I did what I often do when I’m stumped. I took out a notebook and a pen and started to write. I set a timer for a specific time, say 15 or 20 minutes. I write down everything that comes to mind regarding the problem. When the timer beeps, I ask myself: Anything else? I set the timer again, this time for 5-10 minutes, write some more and put down my pen. Then I read through what I’ve written and usually see a pattern emerging. What I saw this time was that my inability to choose was an after-effect of my career switch. In my new life I have time, energy and creativity left for some more adventurous knitting than I’ve done in recent years. That’s absolutely wonderful, but it also takes some getting used to. And I can’t be adventurous all the time. 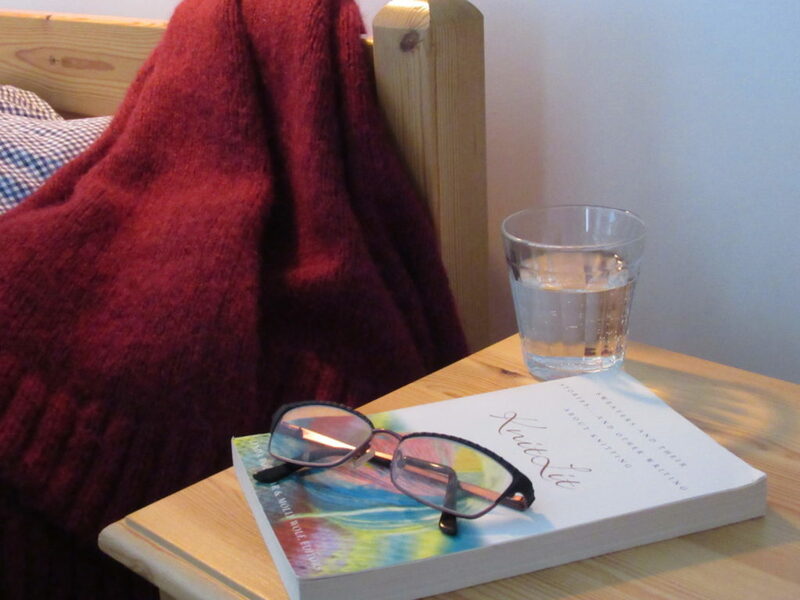 I saw that what I really needed was different knitting projects for different situations, different times of the day/week and different energy levels. After I’d made this little list, it was easy to choose what to knit next. 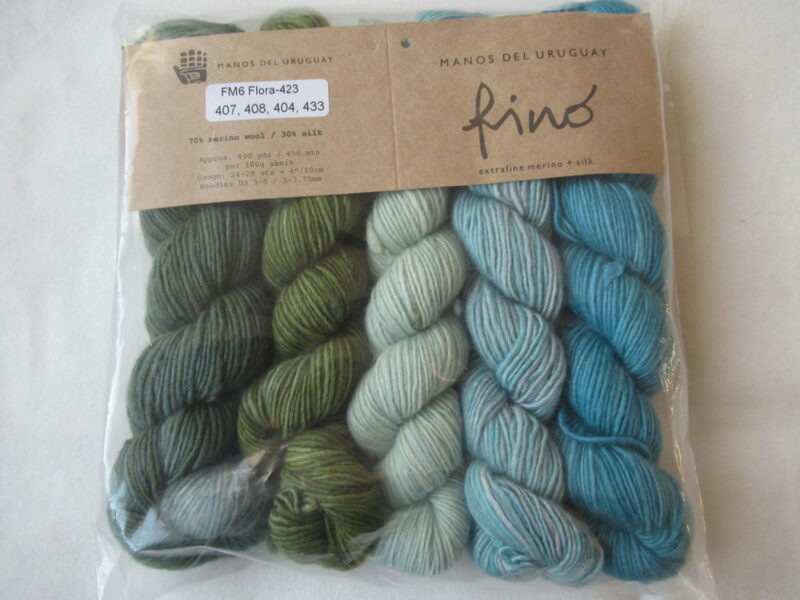 I didn’t have to go shopping for yarn, because I’m the happy owner of an wonderful yarn stash. Another luxury that our grandmothers didn’t have (and I haven’t always had either), and I’m very grateful for it. Here is what I chose for each category. This is ‘Granite’, a stylish cardigan, in a very simple stitch pattern, by one of my favourite designers, Kim Hargreaves. I’m going to make it for our daughter. 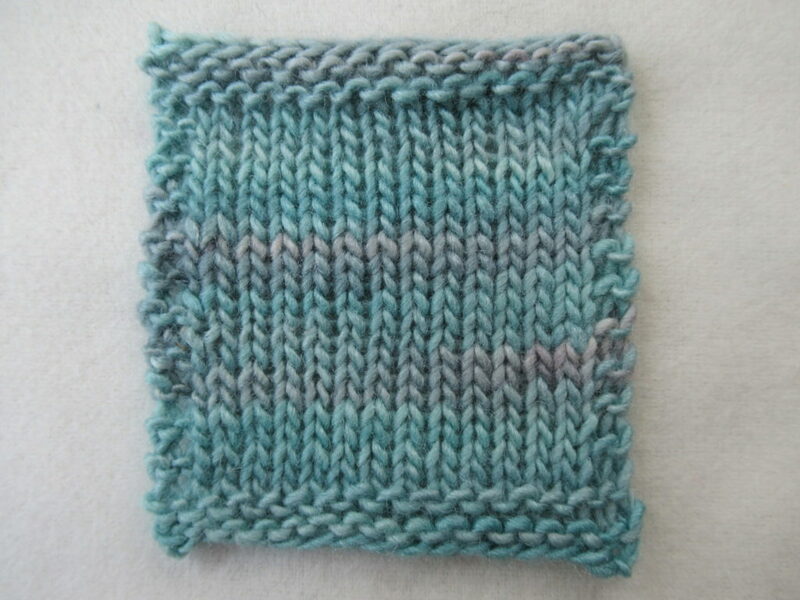 Just the thing to knit on evenings when I crave some meditative, repetitive knitting. 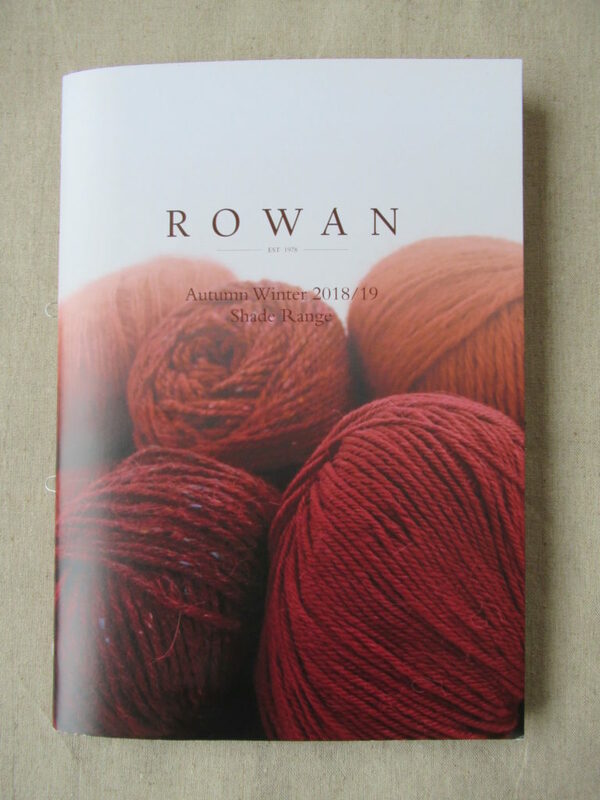 It is knit on small needles, so it should keep me occupied for a while. I bought this yarn kit for a cardigan with a big leaf pattern in Norway years ago. This feels like a huge challenge, and I’m a bit nervous about sharing it here, because I’m not sure I’m ever going to finish it. 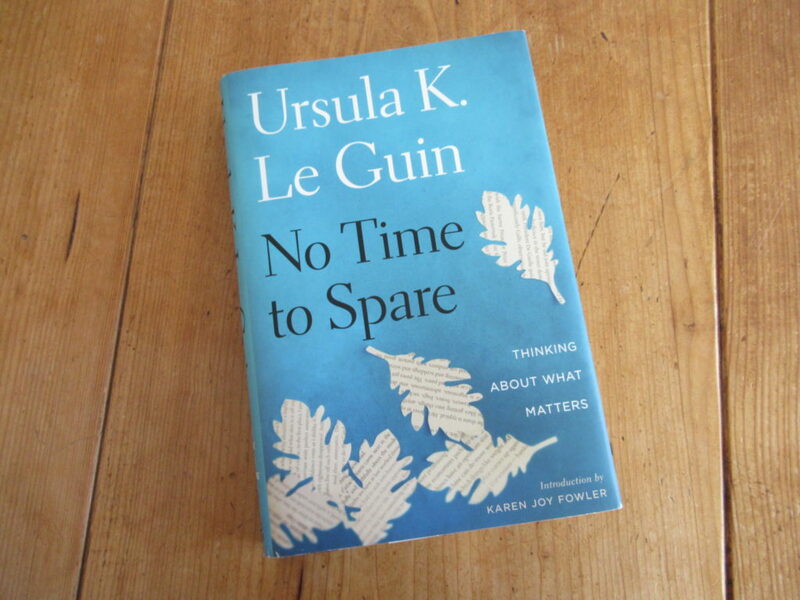 But I am looking forward to starting it. 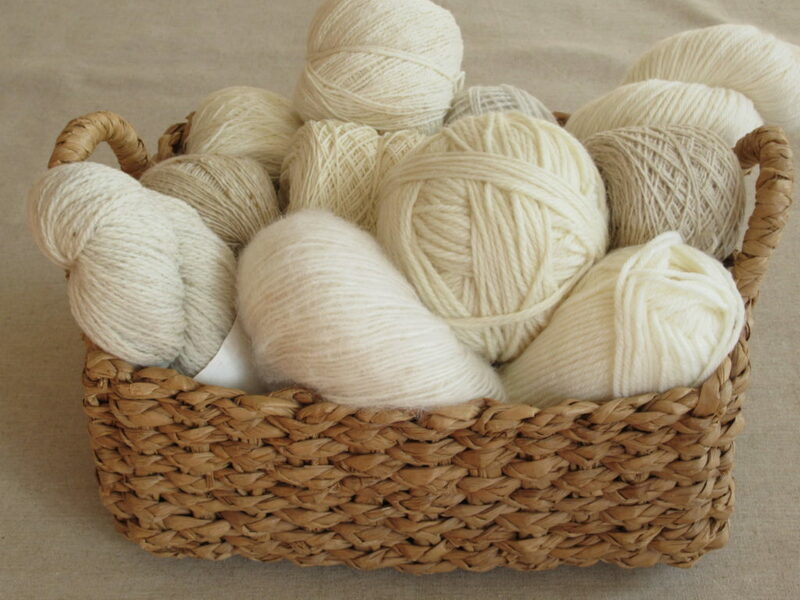 This basket is filled with some new (to me) yarns as well as some left-overs from other projects. Playing with them for me simply means: letting the yarns go through my hands, knitting swatches, experimenting with stitch patterns, and trying out some design ideas that I have. Simple, lightweight, portable, this Color Play Mohair Scarf is knit in four colours of a lovely mohair-and-silk blend. 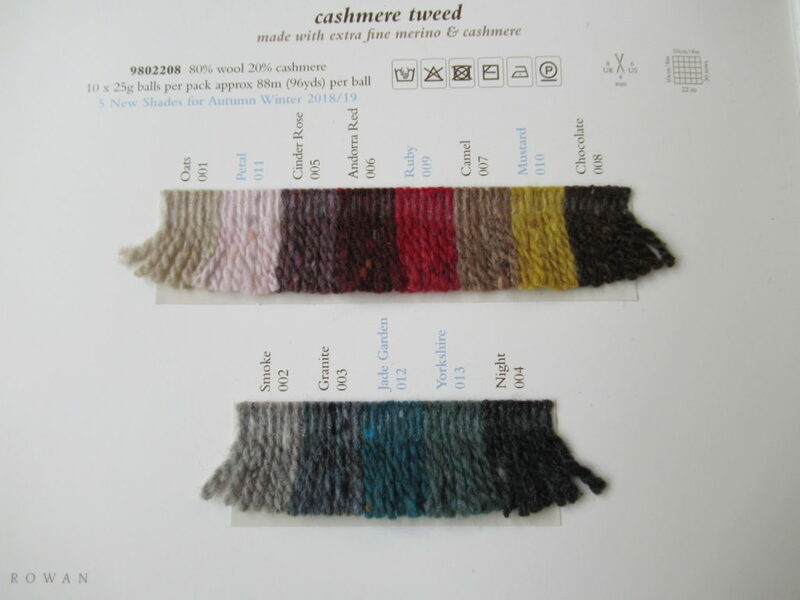 The yarn is thin, but two strands of yarn in different colours are held together throughout. 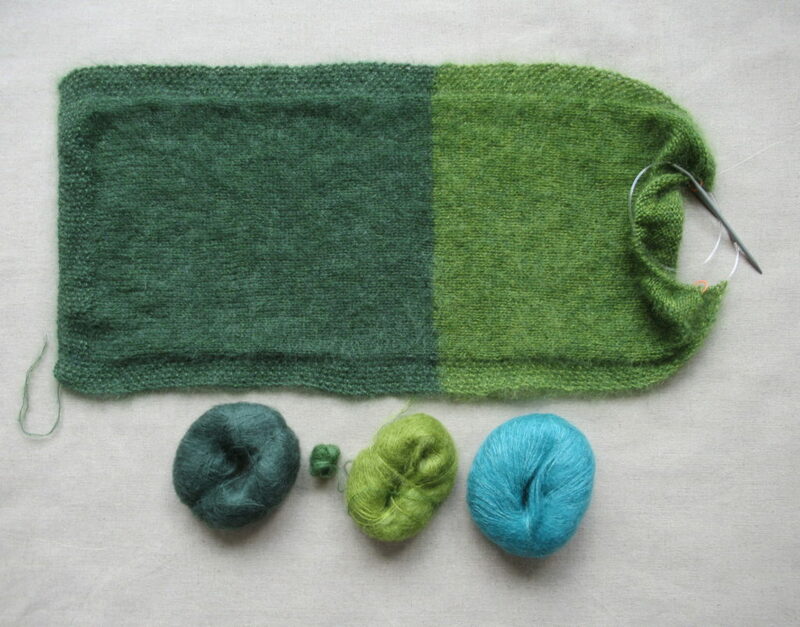 This is an ideal project for knitting on a train or bus, in a waiting room etc. Well, I surprised myself there. 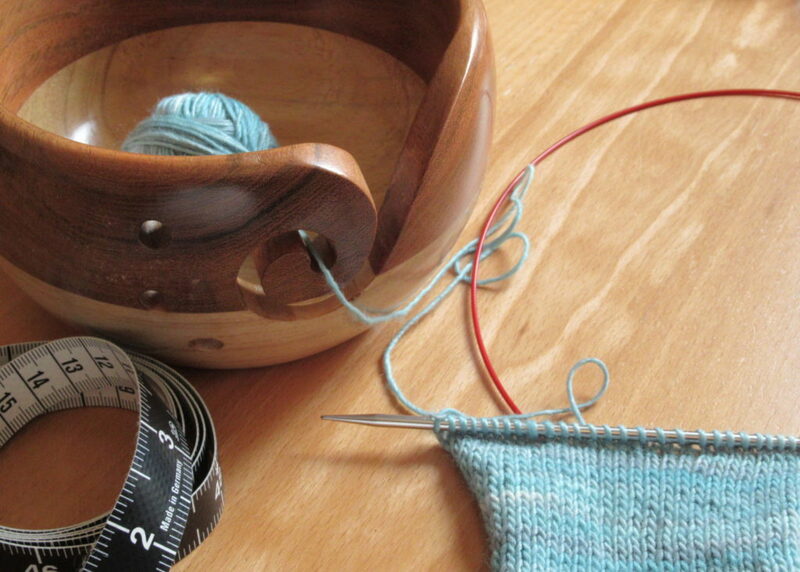 I’d intended to just introduce some new knitting projects, but it evolved into something more than that. Thank you for reading. I’ll keep you posted about anything worth sharing about these knitting projects. Next time I’ll tell you where I got the ‘challenging’ yarn kit. 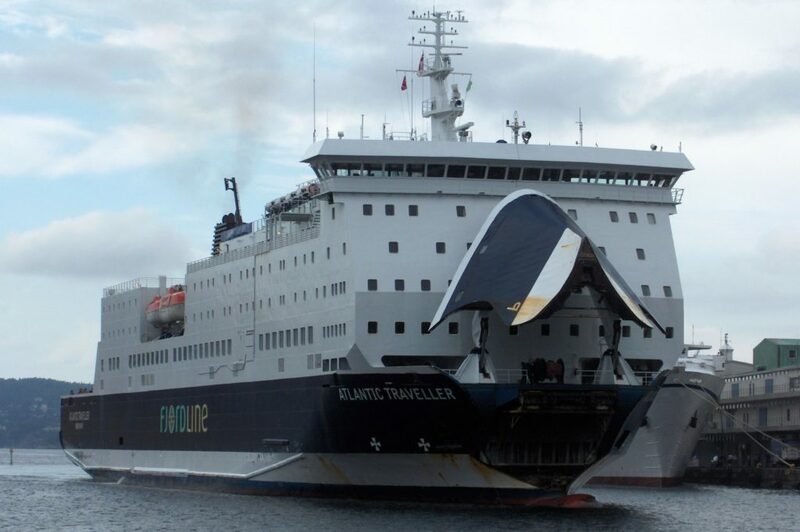 I hope you’ll join me on the ferry to Norway. 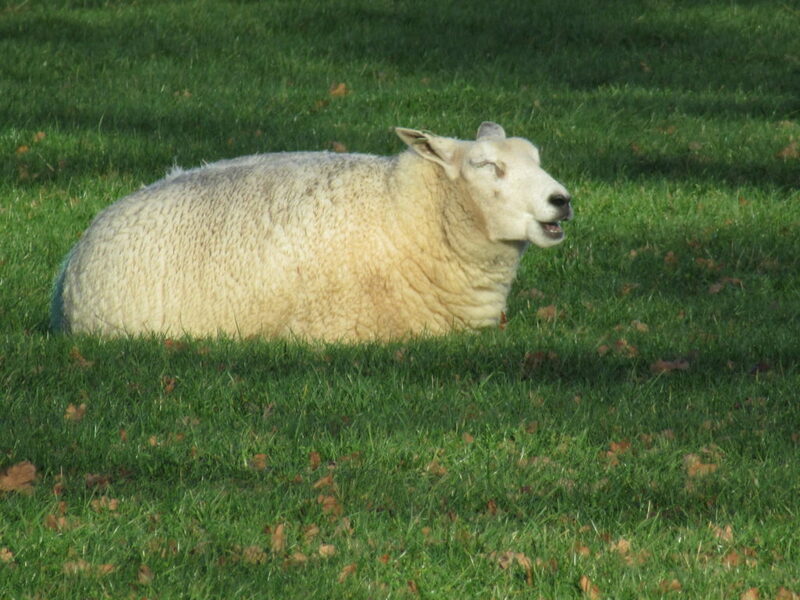 By far most of the sheep surrounding us are of the well-known Texel breed. Stocky, white-fleeced sheep, like the woolly lady enjoying a bit of wintry sunshine in the picture at the top of this post. 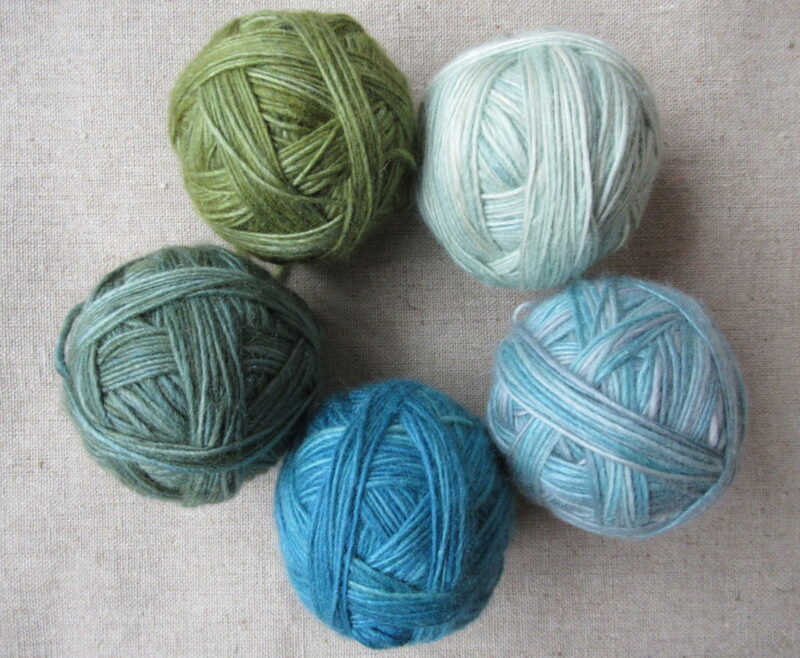 When I started spinning, decades ago, I only spun Texel wool at first. Simply because it was the only wool I could get at the time. 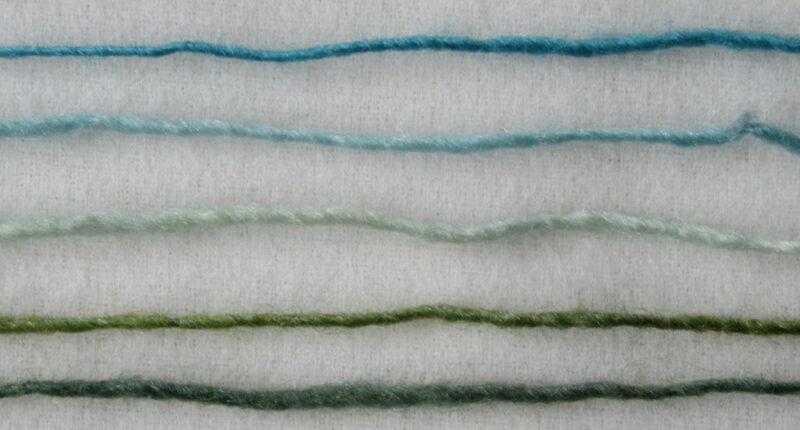 Since then I’ve tried out various other sorts of sheep’s wool and non-sheep fibres. Even some nutria (also known as coypu rat). Ugh, never again! But let’s not get distracted – back to sheep. We do have other sheep breeds in the Netherlands – 67 other breeds, in fact. (I didn’t know that. I looked it up.) 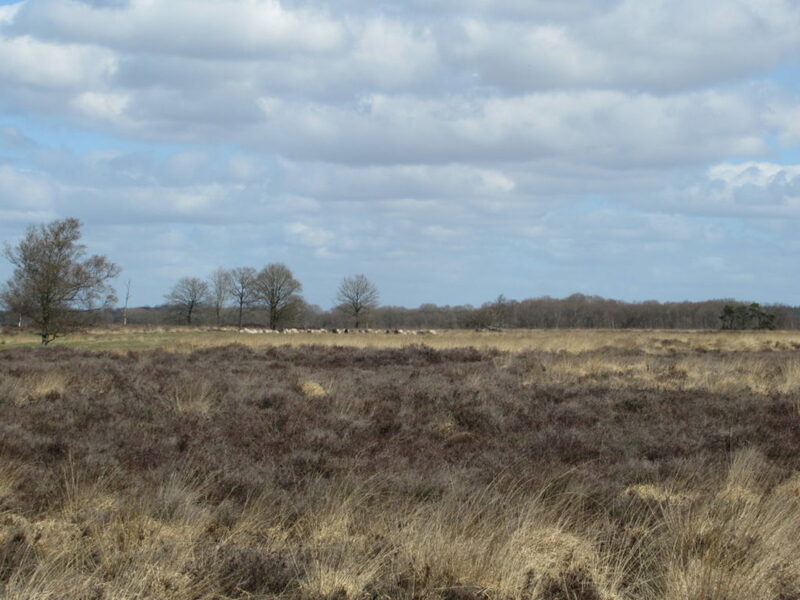 One of these is the Drenthe Heath sheep. 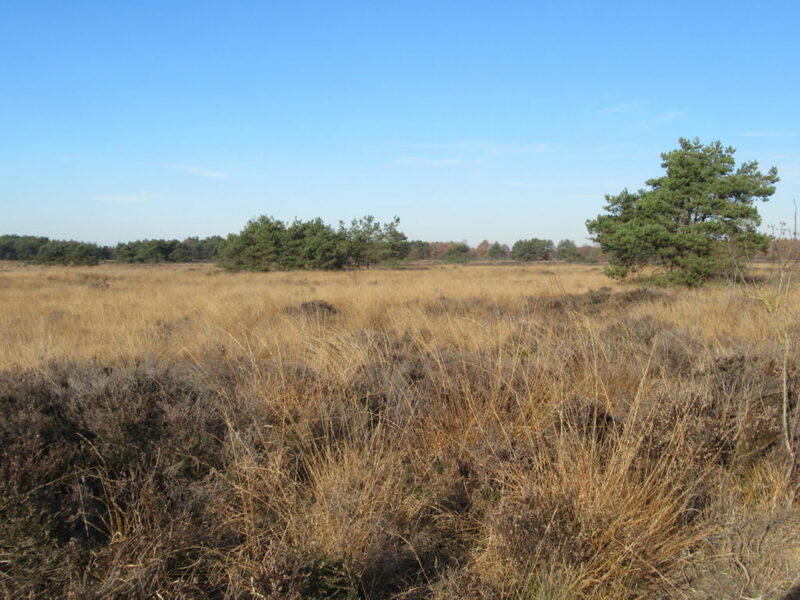 There are several flocks of Drenthe Heath in our part of the country, and we sometimes meet them when we’re out walking. On one of our Sunday walks I already spotted them from a distance. How nice that they’re here today! (We never know exactly where they are – it’s always a surprise.) But when we came closer, something seemed different. Strange. Wrong. Normally they roam freely over the heath, but this time they were all huddled together. 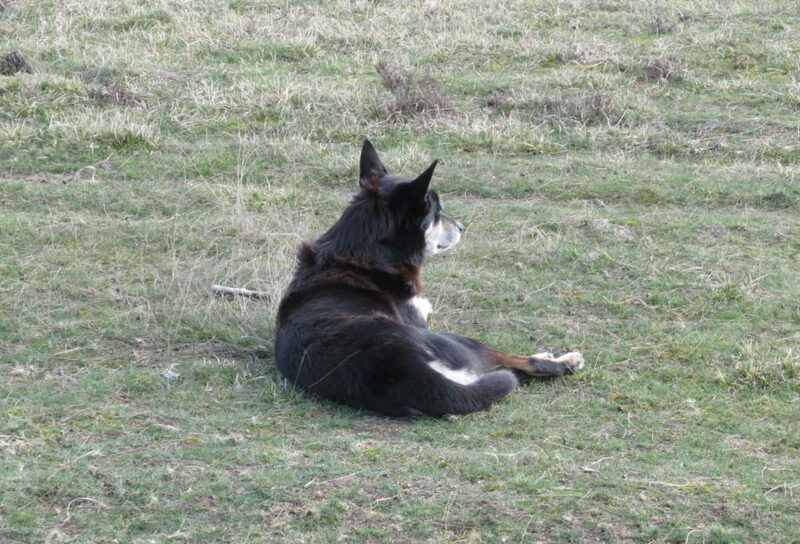 Then the sheep dog, a Border Collie, came back with the shepherd close on its heels. We asked him (the shepherd, not the dog) what was the matter, and he told us that one of the sheep had broken a leg, jumping into a ditch. He’d had to carry it back to the fold and herded the rest of the flock closely together to keep them safe while he was away for a while. The shrubs would be followed by trees. 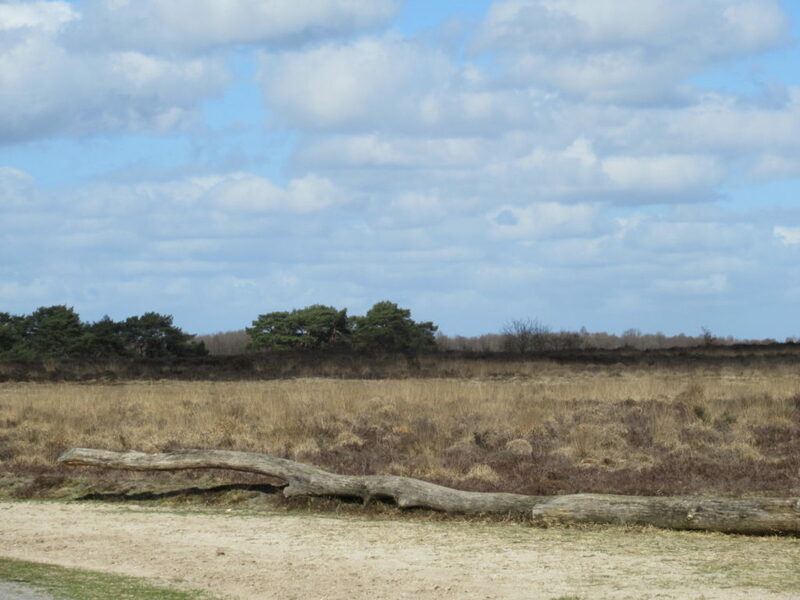 And the heath, with all its rare flora and fauna, would be gone within a decade. 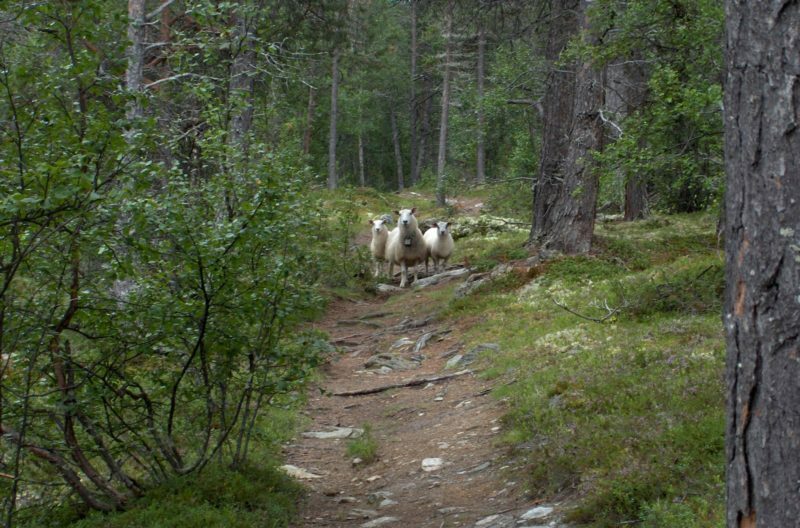 Thank you so much, dear sheep, for preserving this beautiful habitat for us. 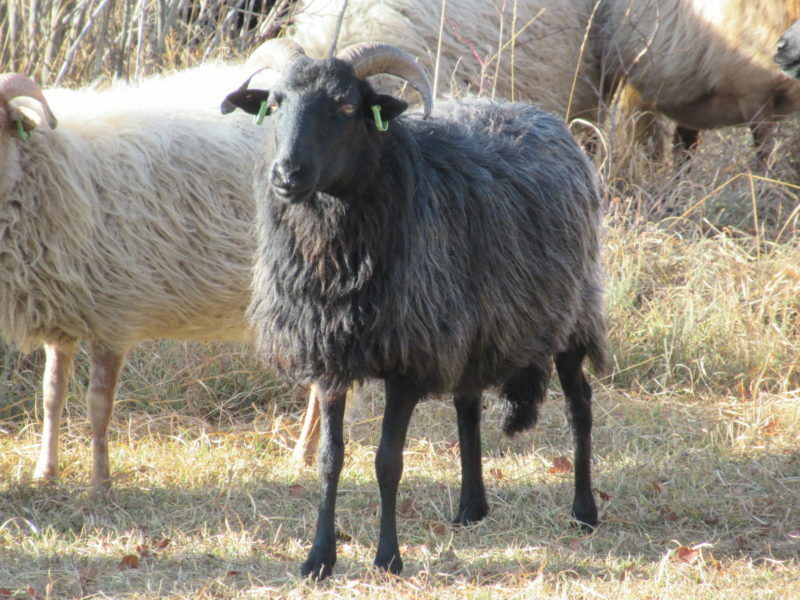 Although these are the native sheep around here, I’ve never spun any of their wool. 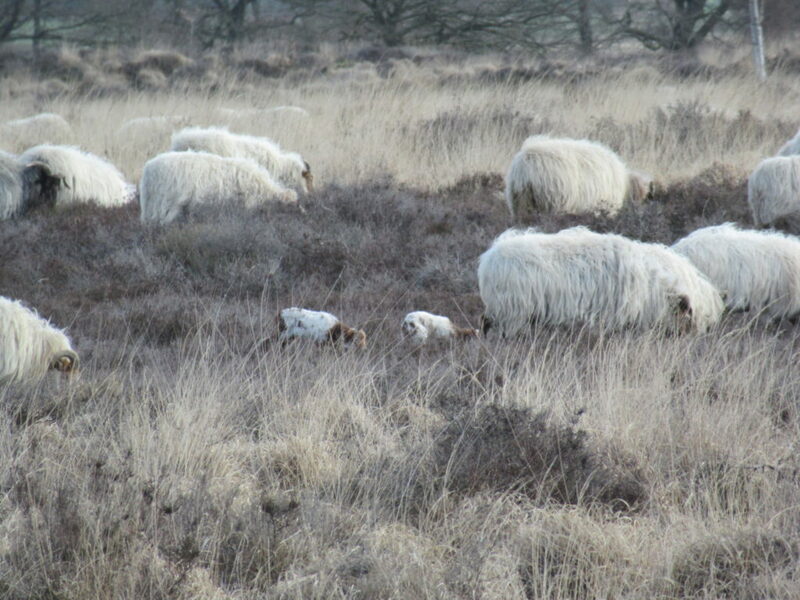 To be honest, I actually know very little about Drenthe Heath sheep or their wool. 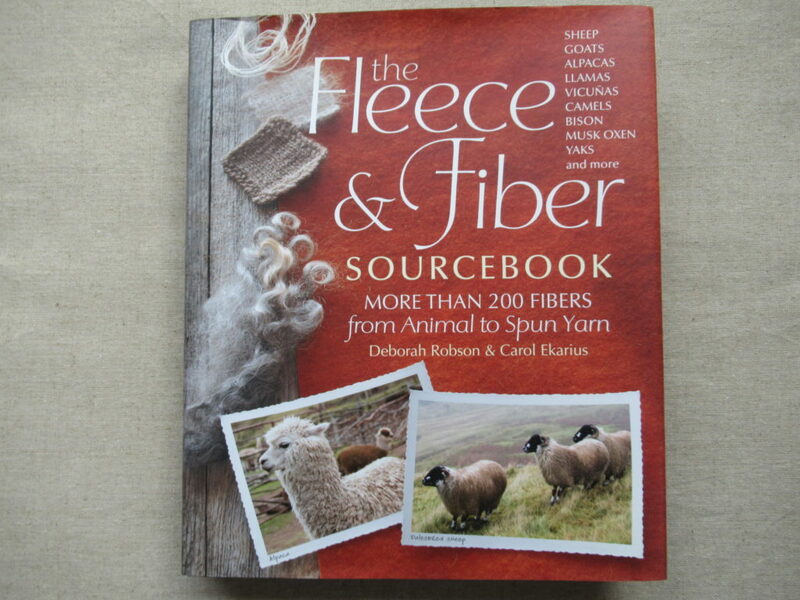 So when we got home I got out my Fleece & Fibre Source Book. Yes! They’re in the index – go to page 313. And what does it say on page 313? The breed is mentioned under Zwartbles, as one of its ancestors, ‘the horned and hairy-fleeced Drenthe (outside the scope of this volume)’. Not very helpful. Well, I’ll have to go looking for more information elsewhere. There’s always the internet, of course. 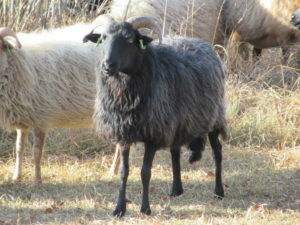 Or I could visit some of the flocks and chat with other shepherds. I know that the Shepherds of Balloo have a wool studio, but I’ve never been there. A visit during the lambing season would be something to look forward to. And maybe I could try spinning some Drenthe Heath wool. I don’t know what it’s like or if it would be suitable for knitting. 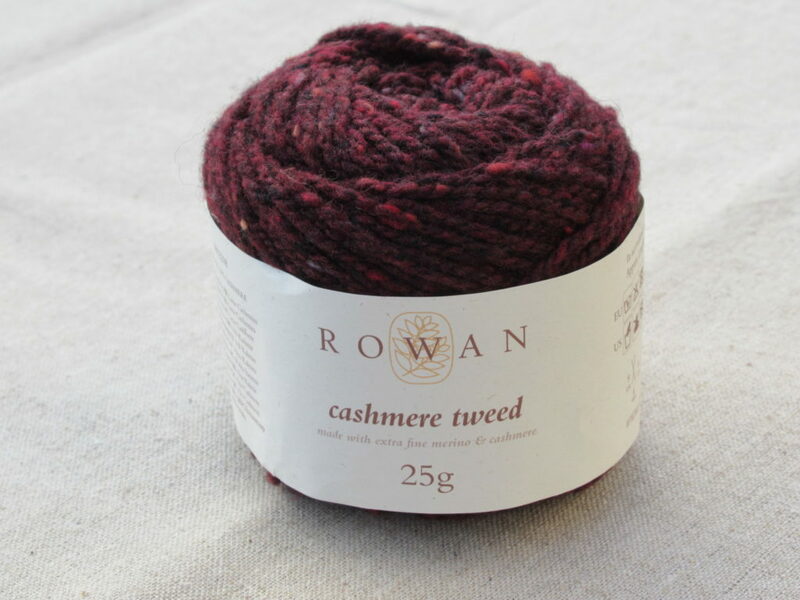 Do any of you reading this have any experience with the wool? If you do, I would really appreciate it if you’d tell us about it in a comment.